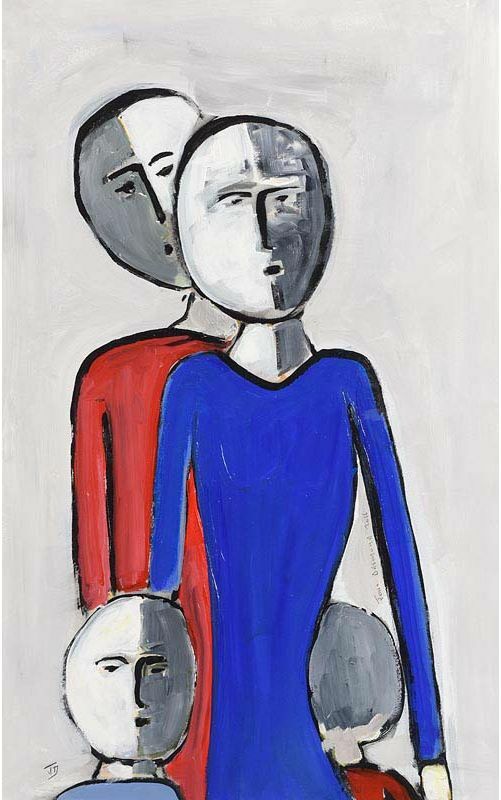 D – Art for Art's Sake! 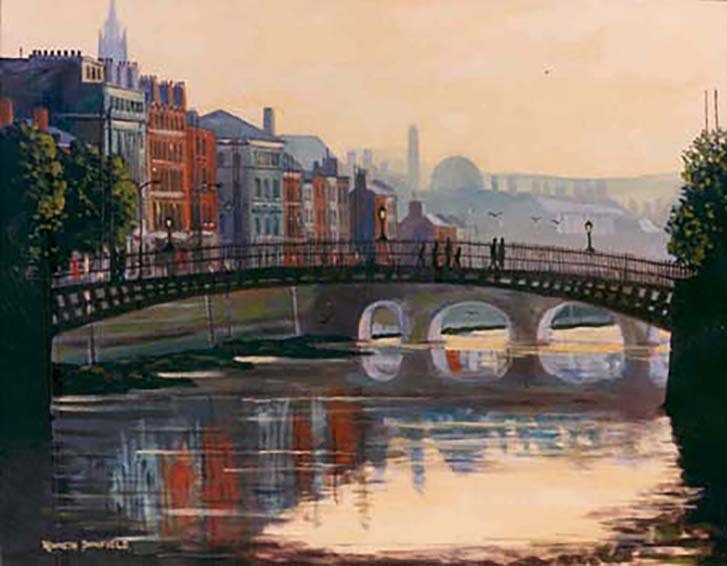 Dublin born artist that has a very broad canvas encompassing traditional landscapes, street scenes, animals and abstract. Always colourful. 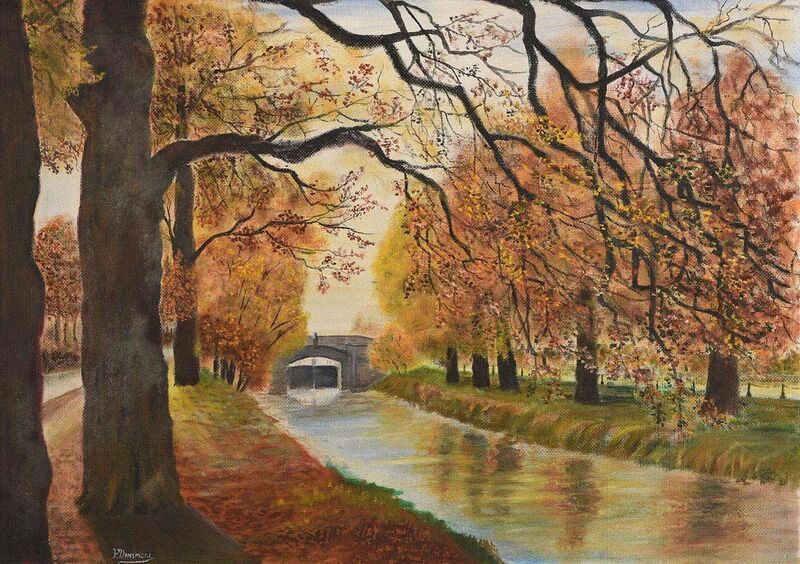 “Canal Scene” watercolour (15″ x 11″). Sold at Adam’s – 16/12/2014 for €280.00. 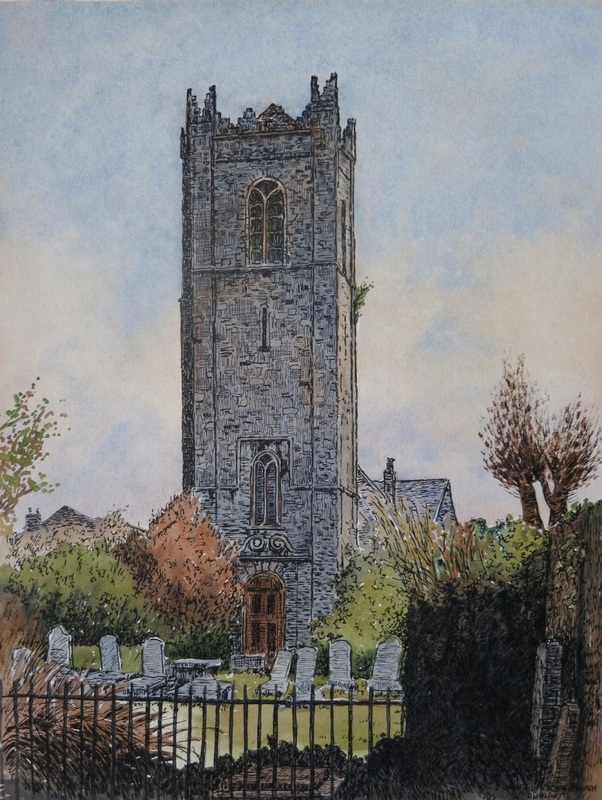 “St.Michan’s Church, Dublin” watercolour drawing (14″ x 10.5″). 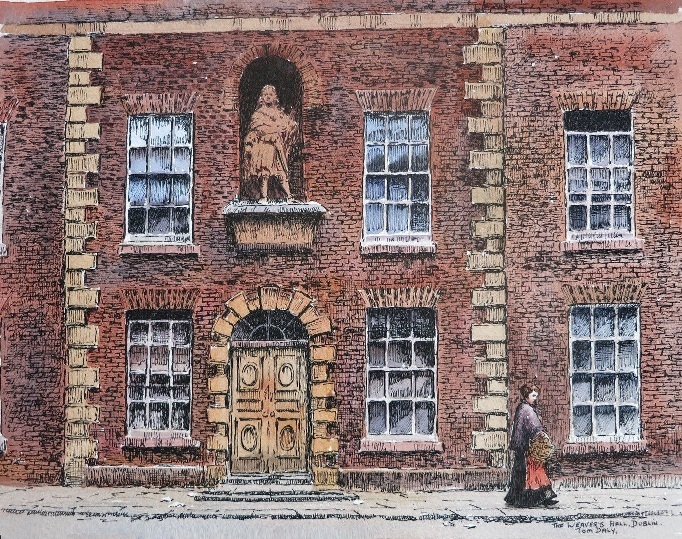 “The Weaver’s Hall, Dublin” watercolour drawing (10.5″ x 14″). Paul D’Arcy was born in Dublin and spent his childhood in South Africa and Namibia. 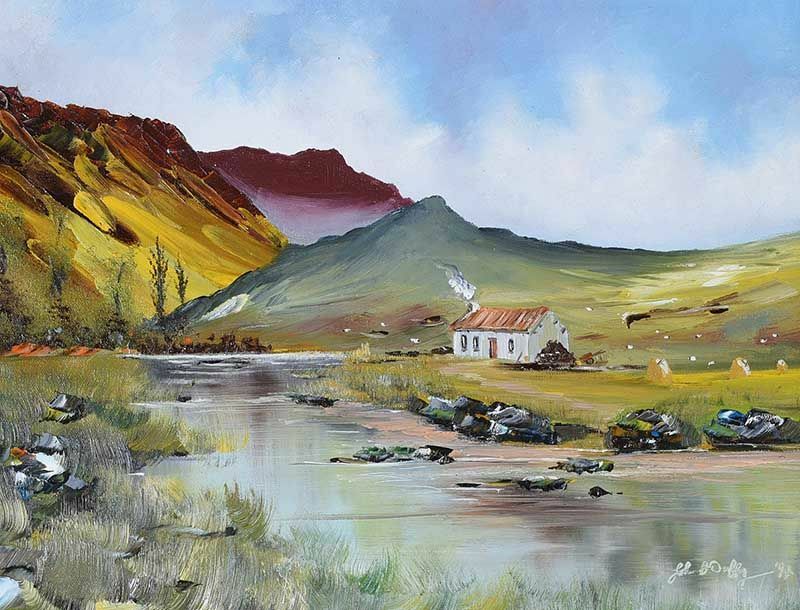 For the past twenty-five years he has been working as a full time artist and has travelled extensively throughout Europe, India, Australia and New Zealand. 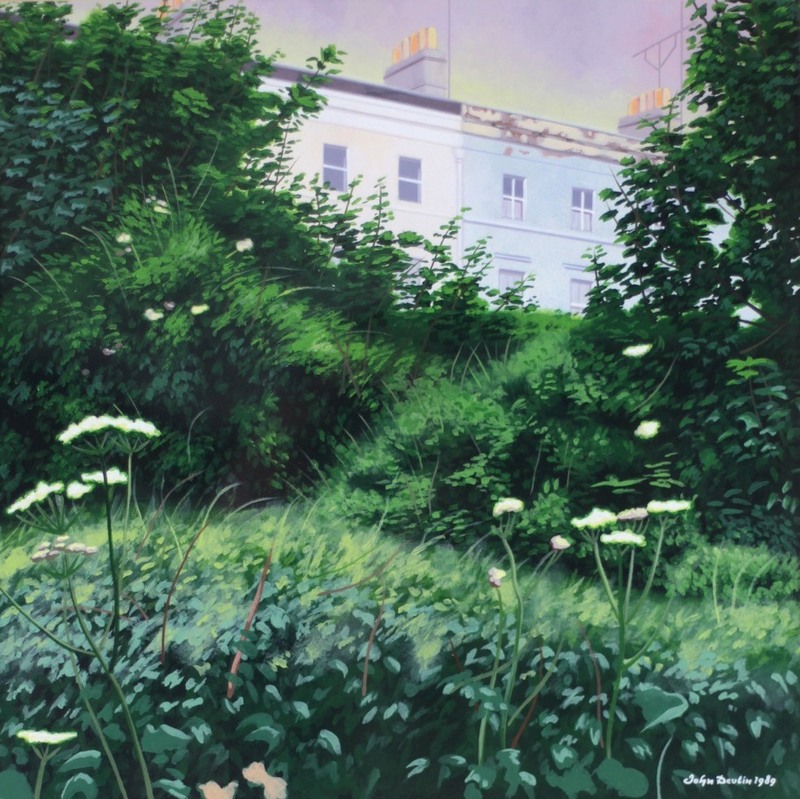 As an artist, he briefly attended NCAD & DCAD art colleges, Dublin and spent some time in the National Gallery of Ireland during the mid-eighties copying work from its collection but he is primarily self-taught. 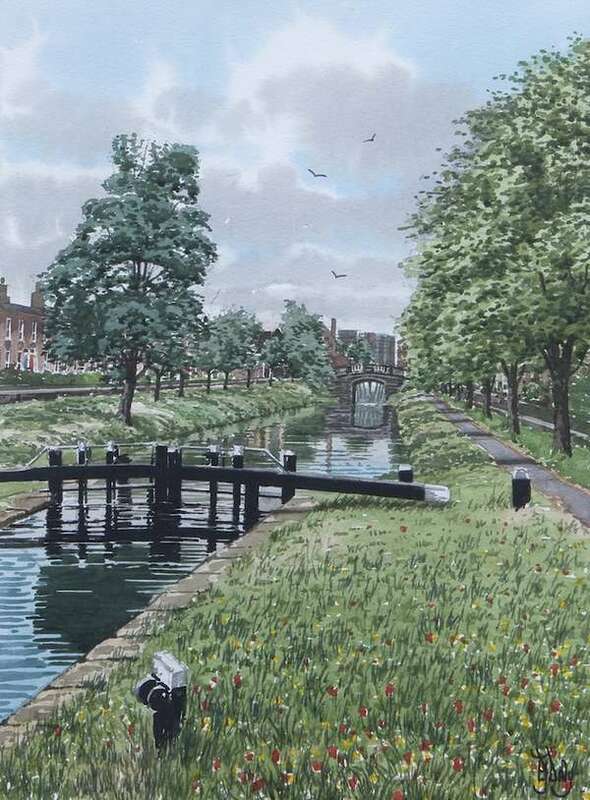 Paul has been painting since a child and after leaving school and has worked in various jobs while continuing to paint. 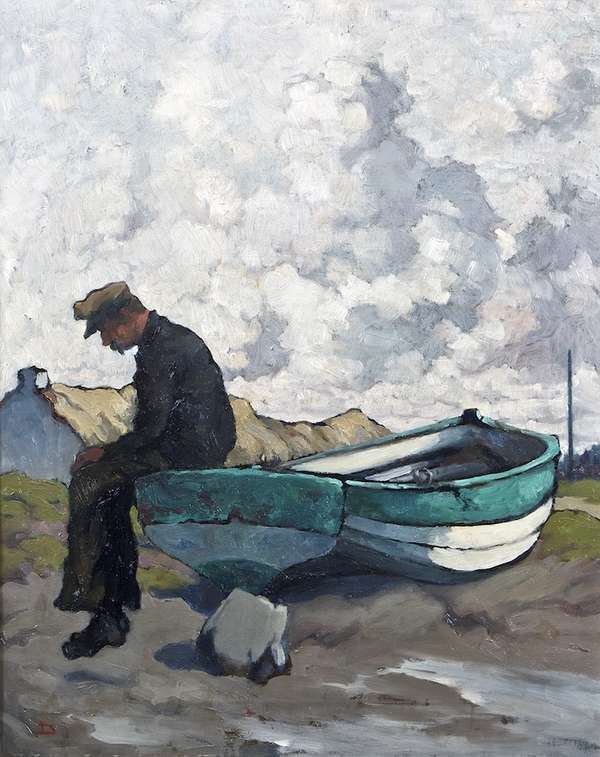 He now lives and works in the seaside town of Skerries, Co.Dublin. 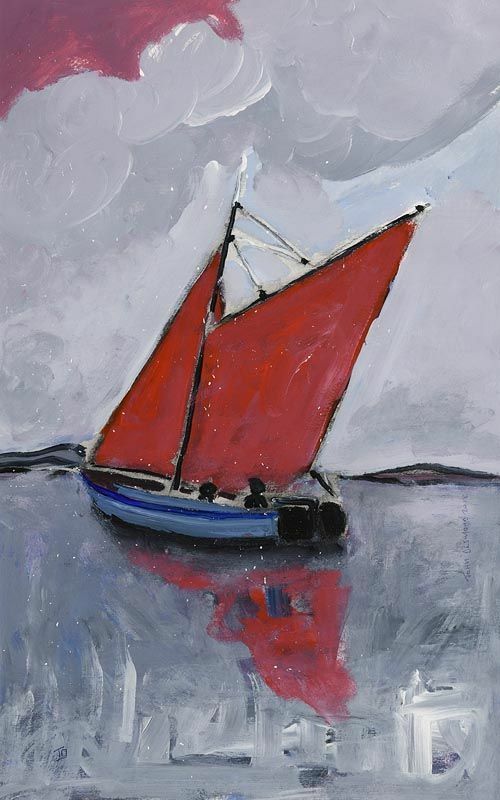 Greystones born artist now living and working in Galway. 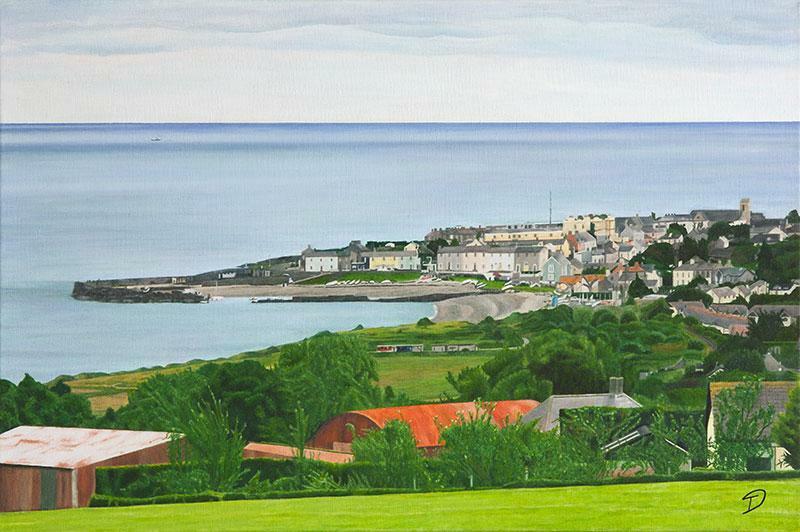 “Greystones Harbour, 2007” oil on canvas (19.5″ x 27.5″) – available for sale here. 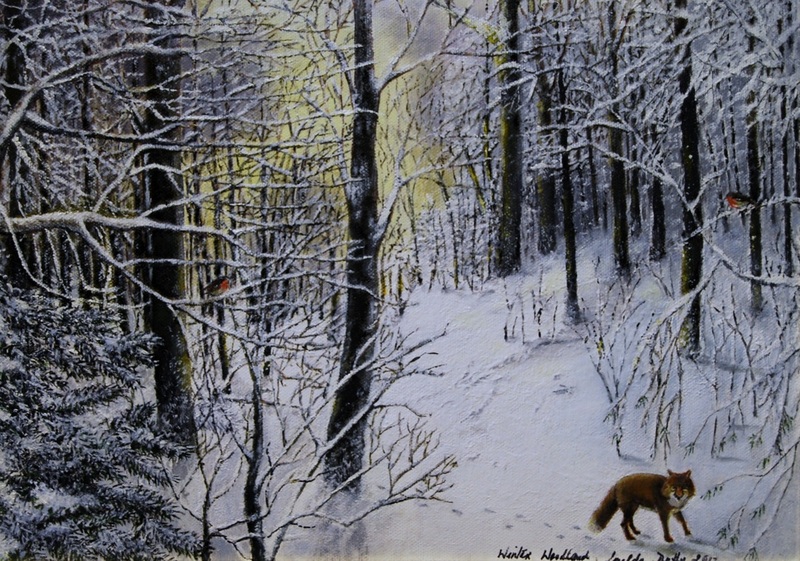 Ballymena born painter, printmaker and photographer. “Release” oil on canvas (24″ x 72″), unsold at Ross’s – 8/8/2018. 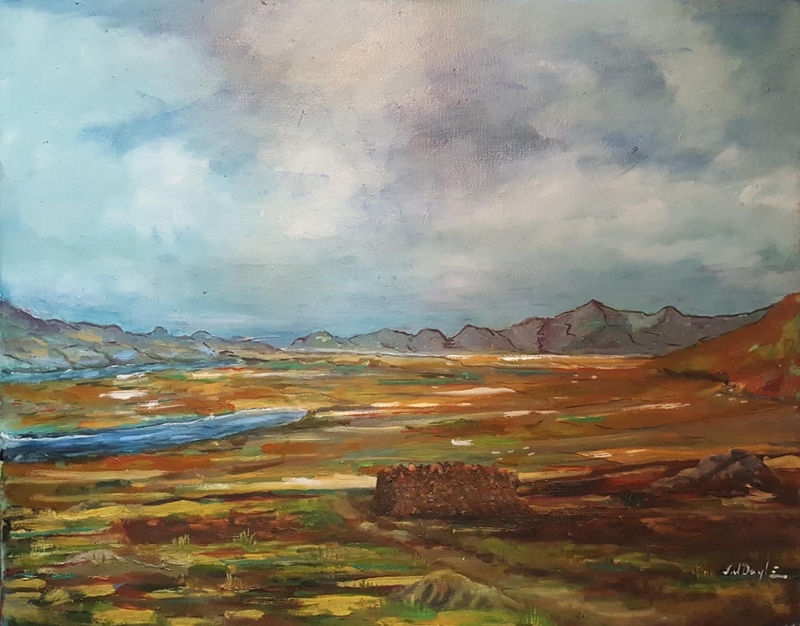 “Connemara Landscape” oil on canvas (20″ x 24″). 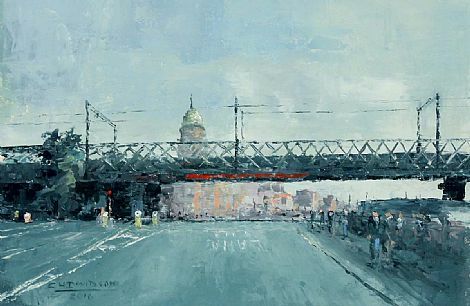 “Liffey Viaduct” oil on board (8″ x 12″), sold at Gormley’s – 13/9/2016 for £180.00. 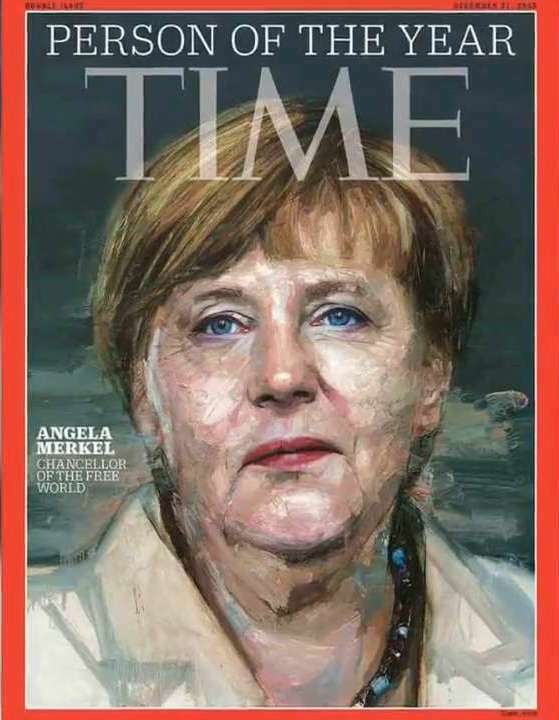 A portrait of the German Chancellor Angela Merkel commissioned by Time magazine and painted by the artist without the benefit of a live sitting. 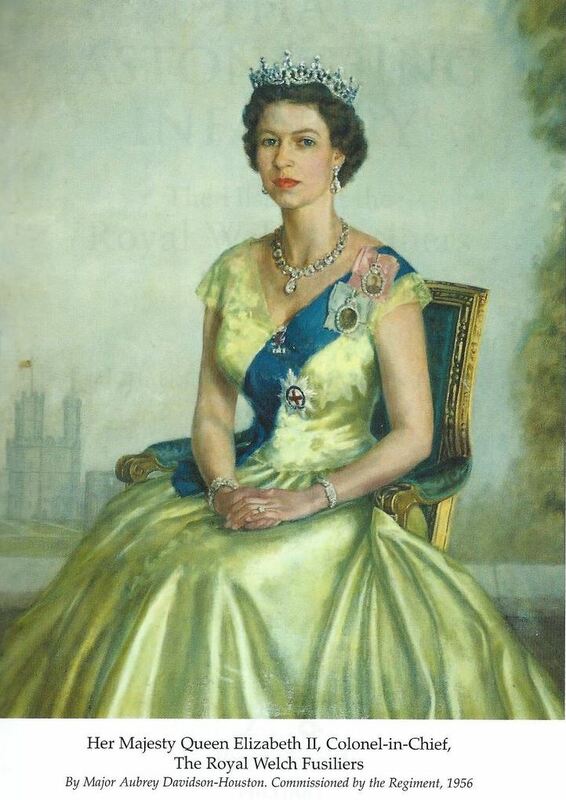 Love or loathe her the artist has captured her perfectly – an iconic work. 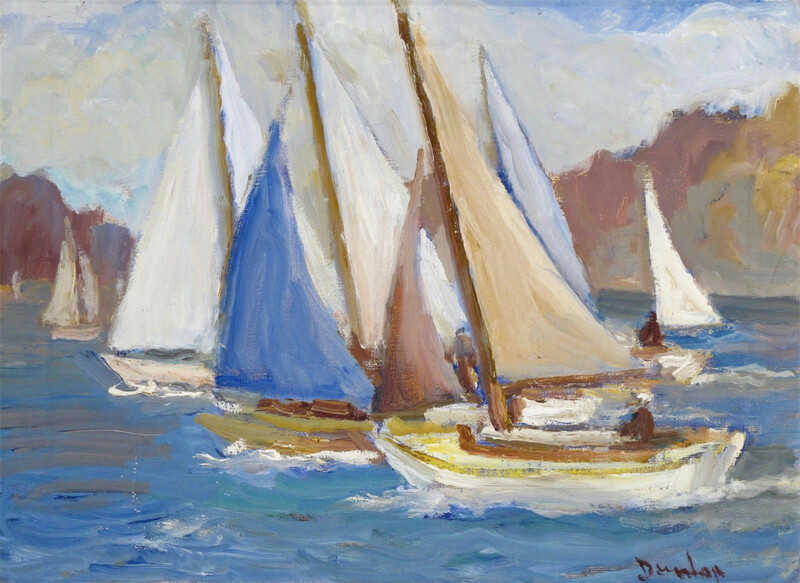 Lilian Davidson was born in Bray, Co. Wicklow where she was educated privately before attending the Dublin Metropolitan School of Art. “No More to Sea” (21″ x 16″) oil on canvas. 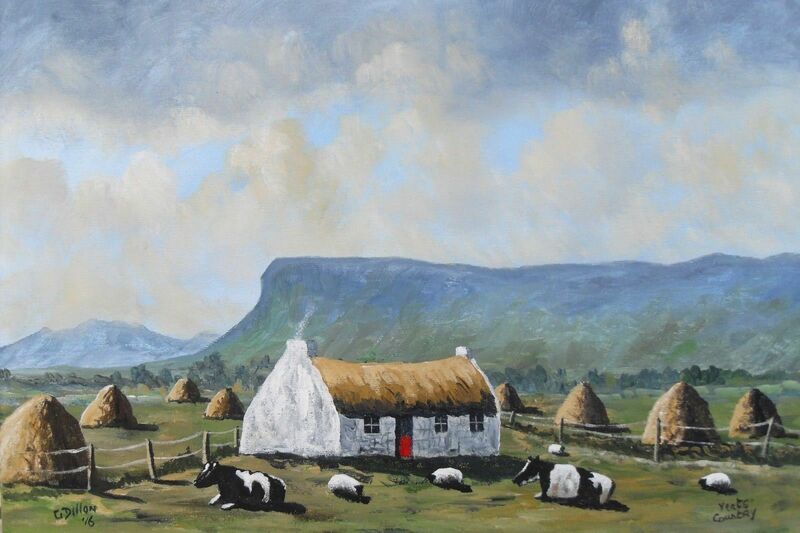 Sold at James Adams – 26/3/2013 for €8,000.00. 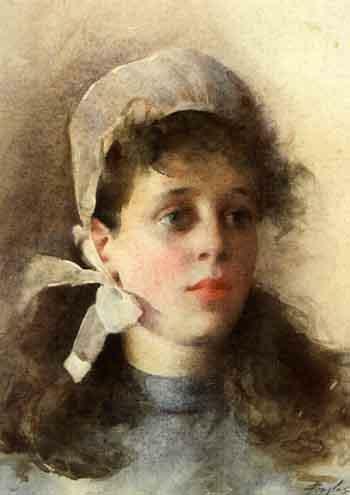 Born in Belfast and studied Fine Art at the Belfast College of Art. 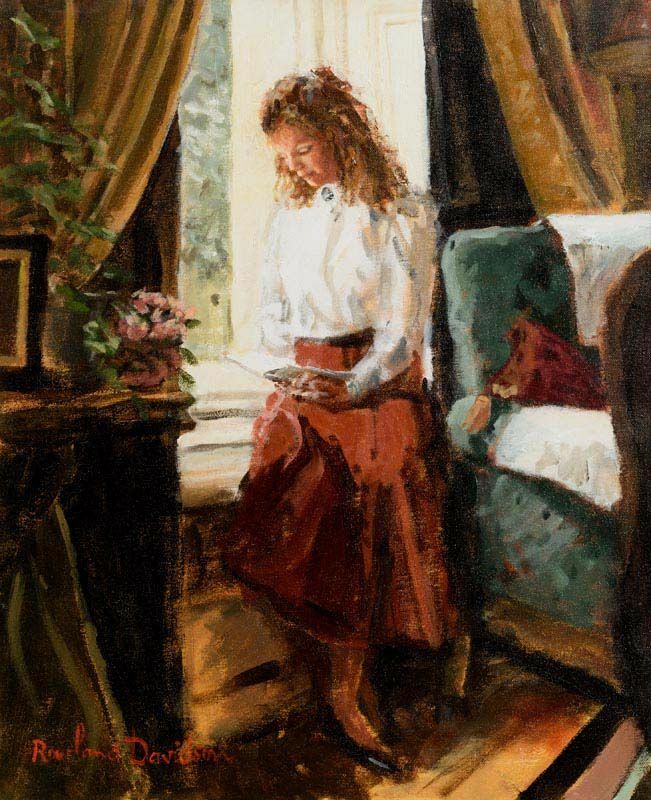 “Reading in the Sunlight” oil on canvas (22″ x 18″), sold at Morgan O’Driscoll’s (RDS) – 10/4/2017 for €1,100. Dublin born soldier and artist. 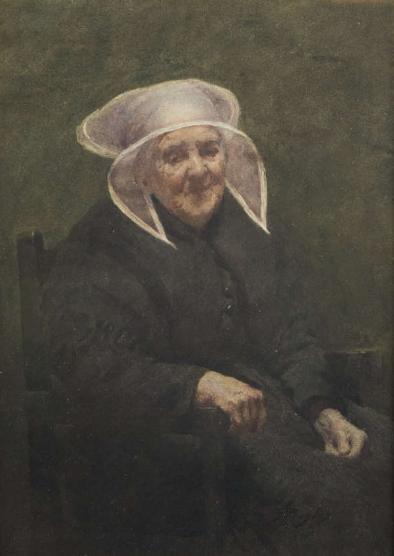 “Portrait of Rita, the Lady Smallpeice“, dated 1979, oil on canvas (23.5″ x 19.5”), sold at Sean Eacrett’s (Doyle’s Schoolhouse Sale) – 30/9/2017 for €80. 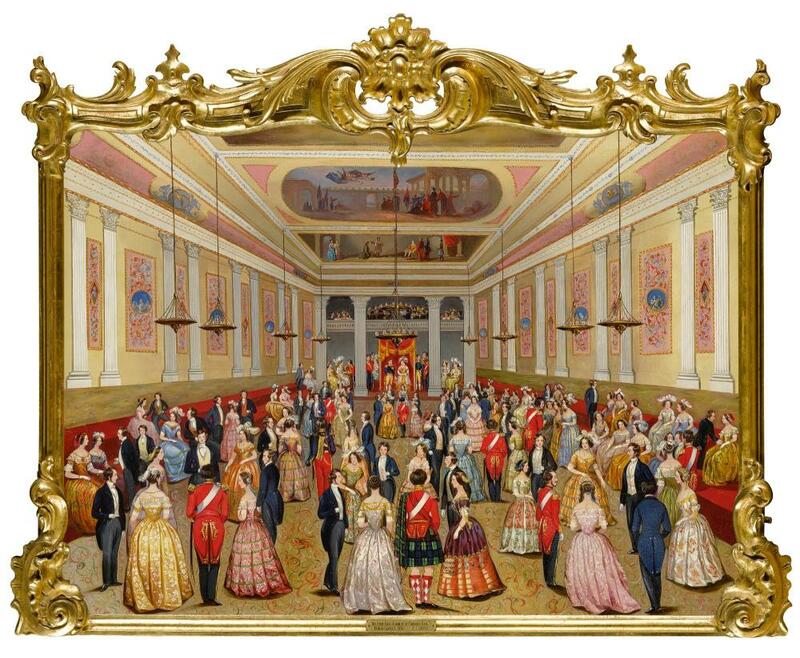 “St.Patrick’s Hall, Dublin Castle” oil on panel (37.5″ x 52″), sold at Sotheby’s (London) – 21/11/2018 for £195,000. St Patrick’s Hall, Dublin Castle is a highly significant and historic work, providing a rare view of both the interior of St Patrick’s Hall in Dublin Castle in the early to mid-19th century as well as of the high society gatherings that took place within it. Such a social gathering as depicted here is all the more poignant when one considers that it is quite possible the work was painted during the course of the Irish Famine from 1845-49, providing a striking juxtaposition between the fortunes of the privileged and the mass suffering of the rural Irish population. – Extract from the Sotheby’s catalogue note. 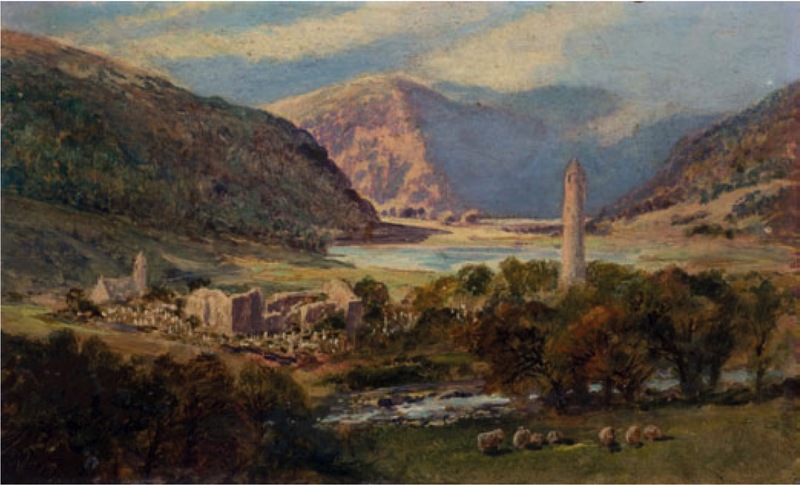 “Glendalough, Co.Wicklow” oil on board (7″ x 11″). 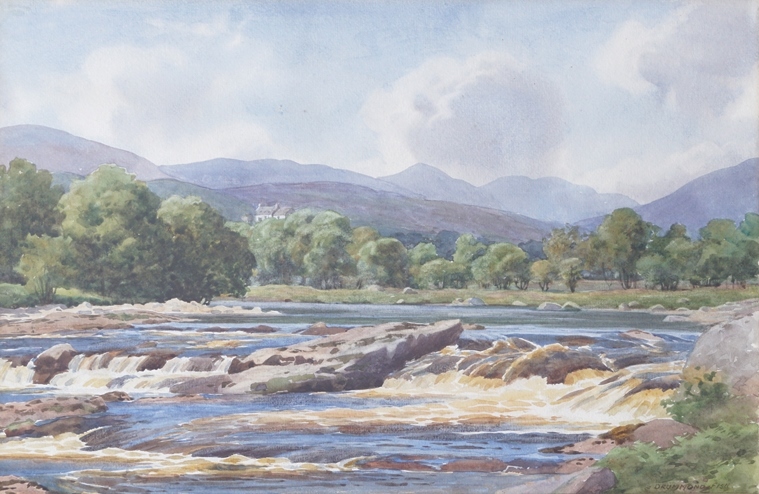 Sold at Bonhams (Chester) – 16/3/2010 for £562.00 including buyer’s premium. 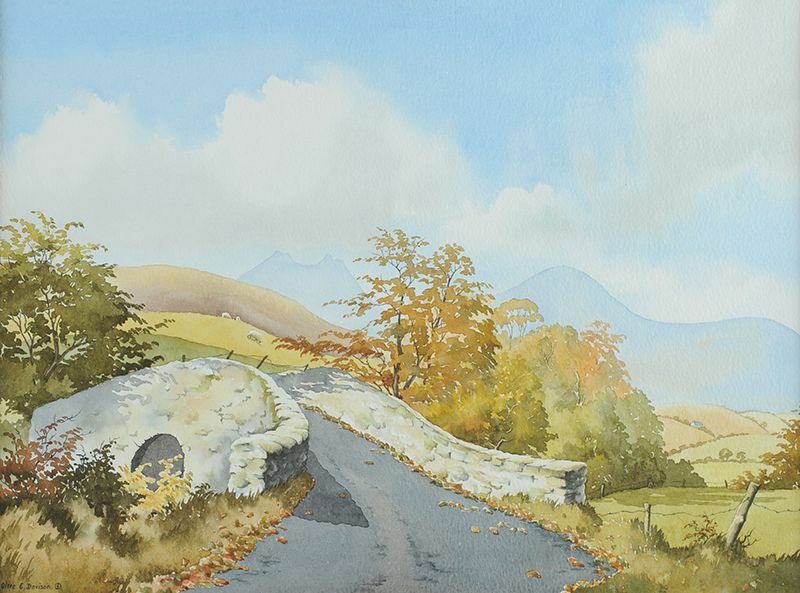 Left to right: “The Humpback Bridge” watercolour drawing (11″ x 15″) sold at Ross’s – 5/11/2014 for £30.00; and “Muckish from Horn Head” watercolour drawing (11″ x 14″). 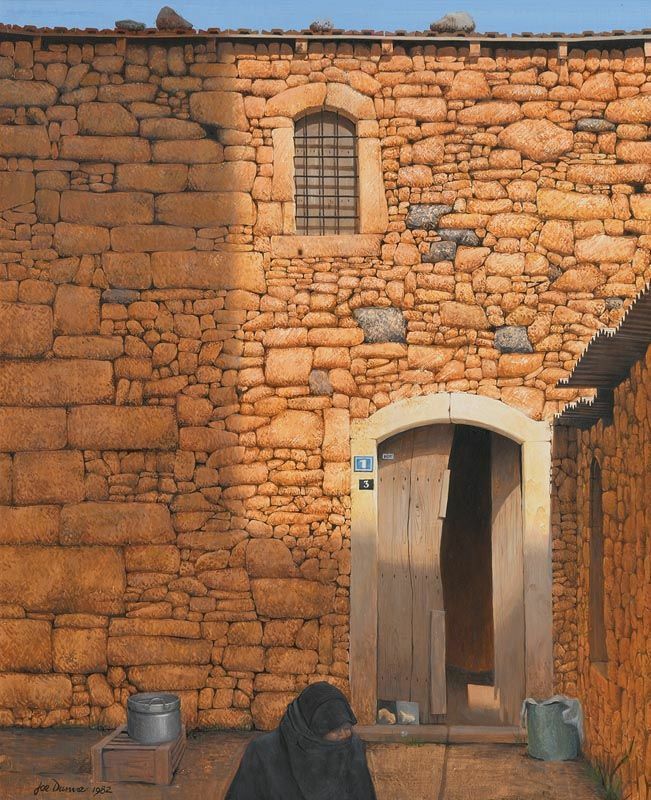 Irish born portrait artist now living and working in Spain. “A view from the Cliff” watercolour drawing (7″ x 15″), unsold at Ross’s 9/11/2016. 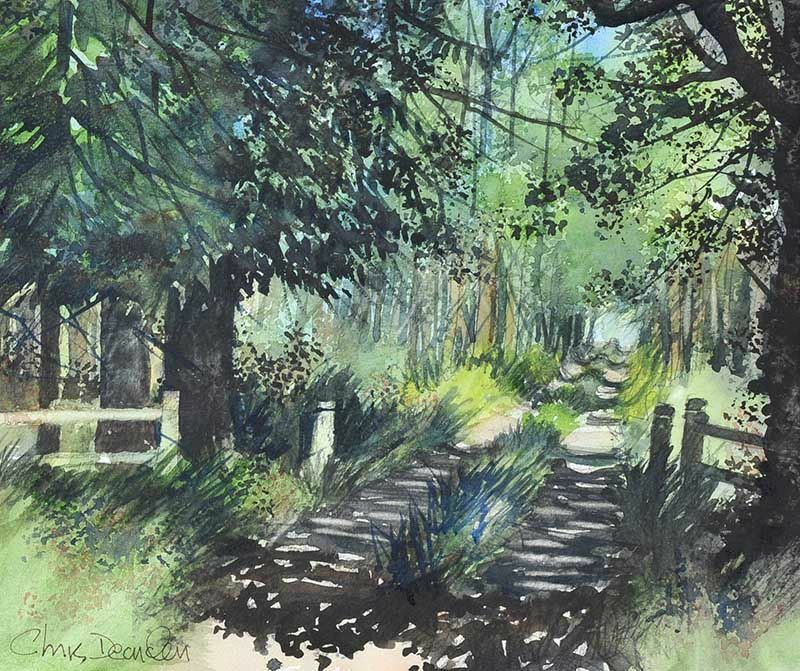 “A shaded path through the trees” watercolour drawing (12″ x 14″), unsold at Ross’s 7/12/2016. 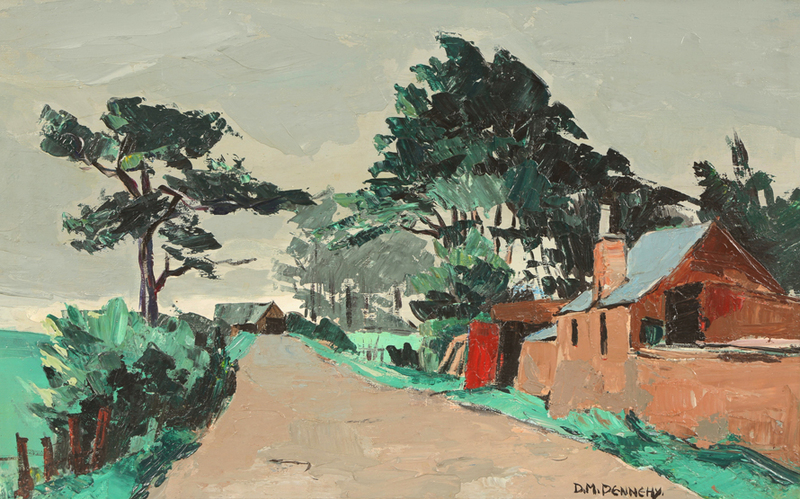 “Country Lane with Farm Steading, Donegal” oil on board (11.5″ x 19.5″), sold at Thomas R Callan Auctioneers, Ayrshire, Scotland – 19/11/2017 for £400.00. “Turf Stacks and Calm Sea” oil on board (30″ x 36″). Left to right: “Island Cottage” acrylic on paper (25″ x 16″), sold at Morgan O’Driscoll’s – 3/10/2016 for €180.00; and “Relationships, Who is Who?” 2016, acrylic on paper (24″ x 16″), sold at Morgan O’Driscoll’s – 22/5/2017 for €160.00; and “The Maryann, Back to Heir Island” acrylic on paper (25.5″ x 16″), sold at Morgan O’Driscoll’s – 10/12/2018 for €160.00. Born in Dublin, John Devlin studied at the National College of Art & Design and worked initially as a graphic designer for the Abbey Theatre. 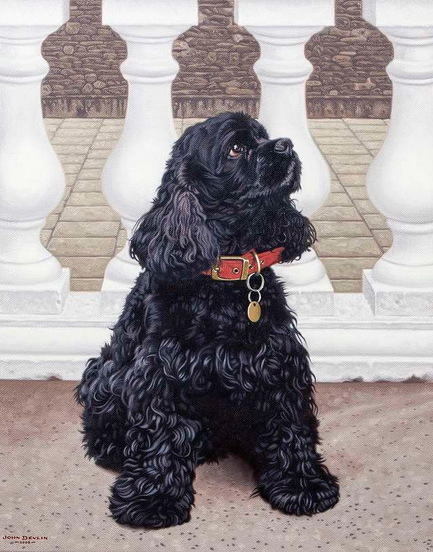 “Coalie” a special commission dated 2006, oil on linen canvas (30″ x 23″), unsold at Adam’s – 28/9/2016. 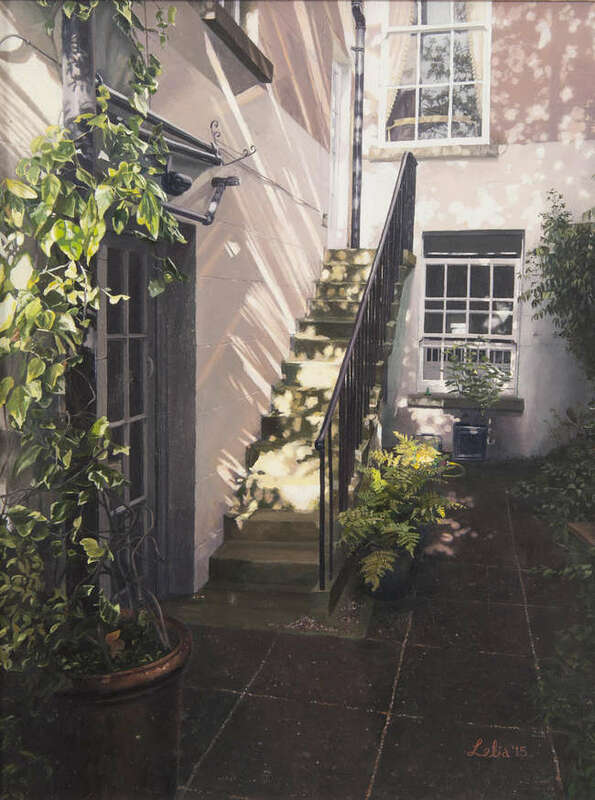 “Longford Terrace, Monkstown, Dublin” oil on paper (15″ x 15″), one of a pair, sold at Mealy’s – 14/11/2017 for €280.00. 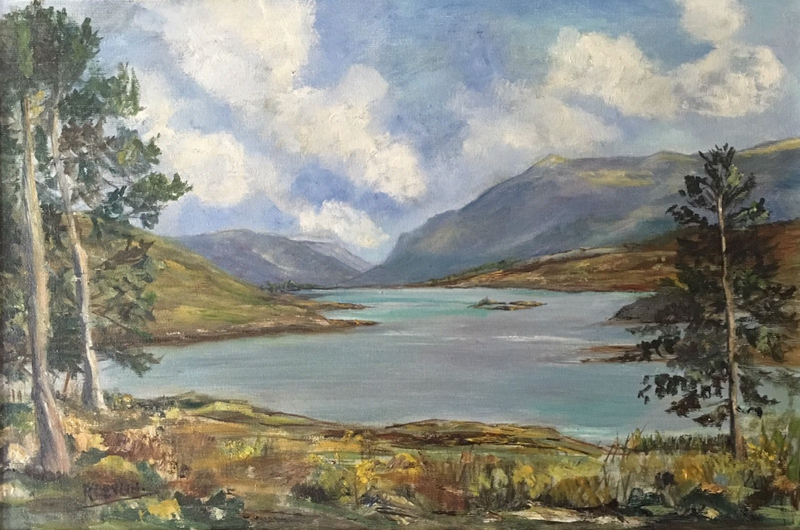 “Glenveagh, County Donegal” oil on canvas (17.5″ x 23.5″). 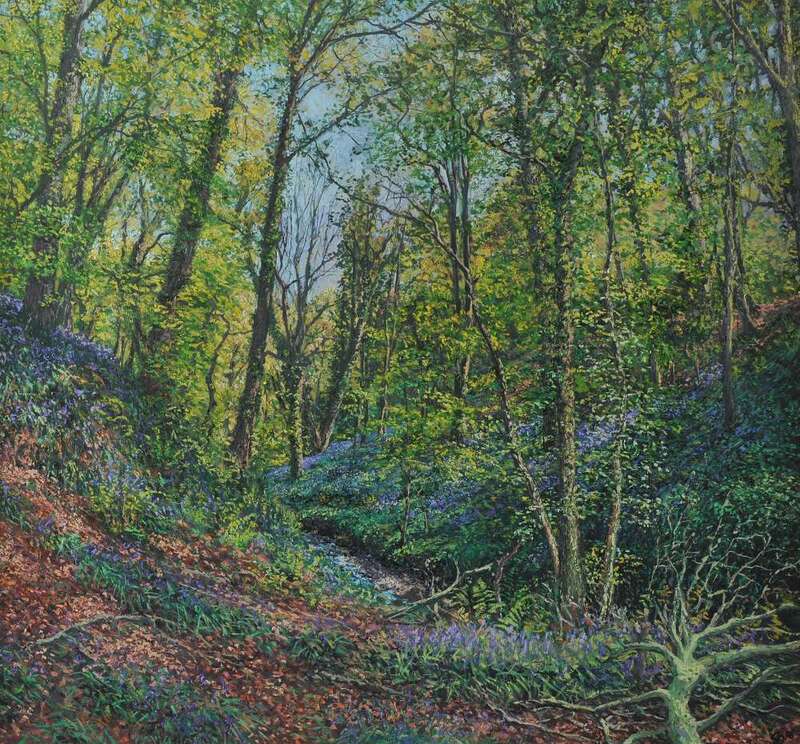 “Bluebell Wood” oil on board (24″ x 36″), sold at Ross’s – 29/1/2015 for £340.00. 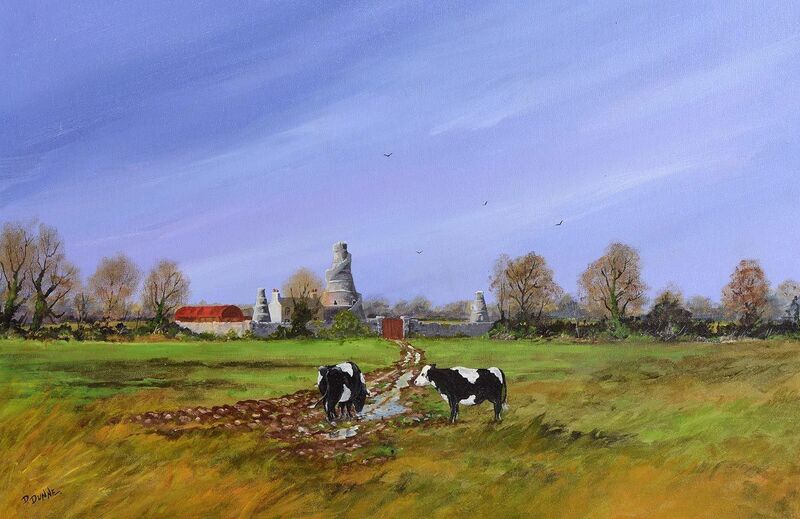 “Country Lane” oil on canvas (36″ x 48″), unsold at Gormley’s – 13/3/2018. Untitled landscape, oil and acrylic on panel (8″ x 10″), sold on eBay – 20/8/2017 for £10.50. “Wicklow Mountains” oil on board (12″ x 16″), unsold at Morgan O’Driscoll’s – 29/1/2018. 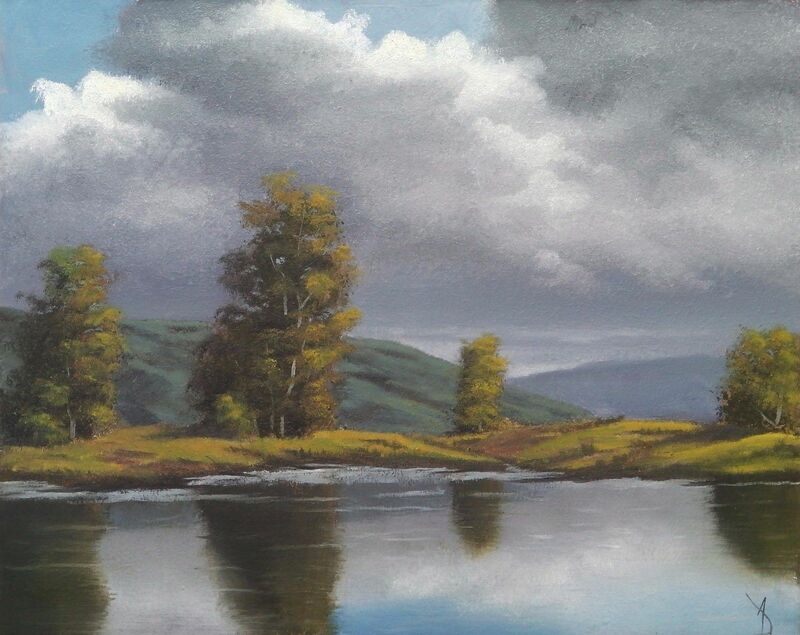 Stephen is a self-taught full time artist. He works and lives in Co. Donegal. “Yeats Country” acrylic on canvas board (12″ x 16″). “West of Ireland” oil on canvas board (16″ x 20″), sold at Morgan O’Driscoll’s – 8/8/2017 for €700.00. “Grand Canal Dublin” oil on board (21″ x 29″), sold at Morgan O’Driscoll’s – 14/8/2017 for €80.00. A primitive landscaper born on Tory Island, Co.Donegal. 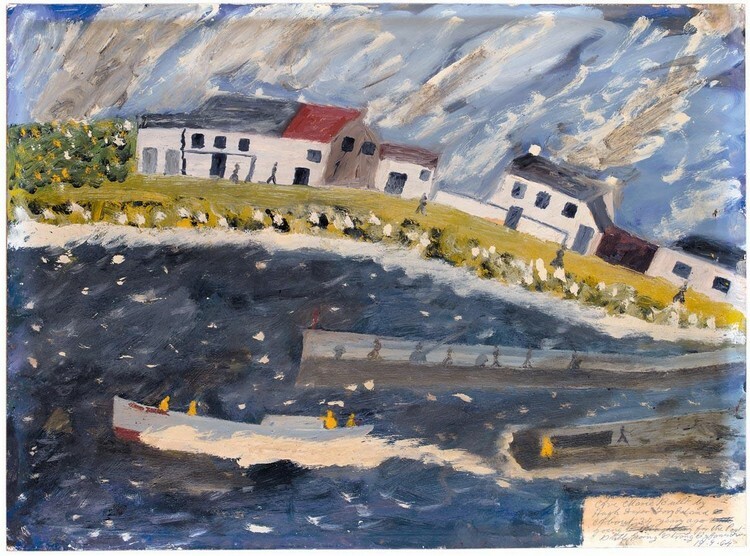 “Ave Marie” (22″ x 30″) oil on paper, laid on board dated 19/9/1964. Full title description: Ave Marie Built by / Hugh Dixon Tory Island / About 35 years ago / Going for the Post / Still Going Strong. 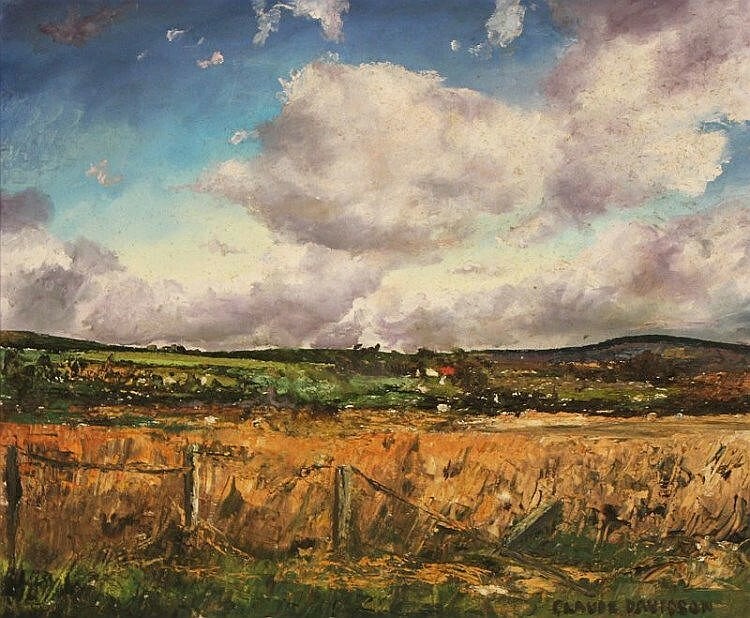 Dublin born landscape and portrait painter. 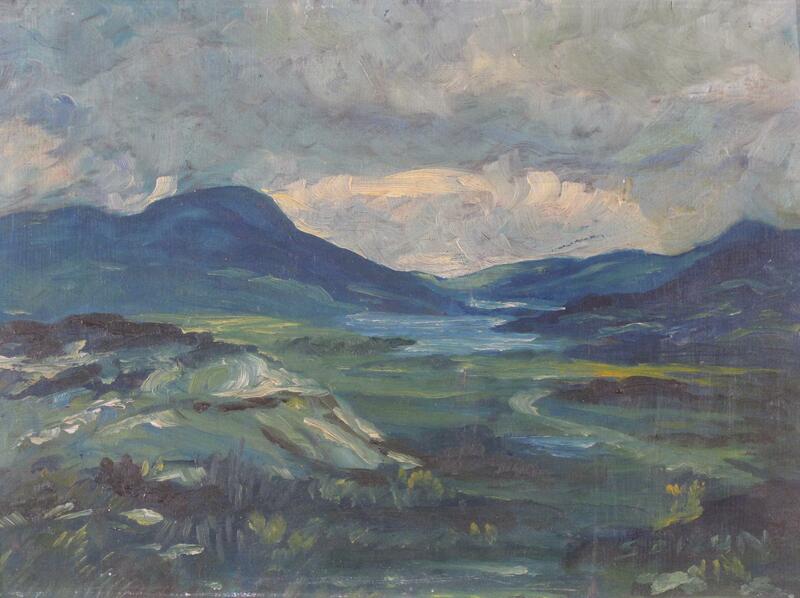 “Ladies View, Killarney” oil on board (11″ x 15.5″), sold at Woolley & Wallis – 21/3/2012 for £140.00. 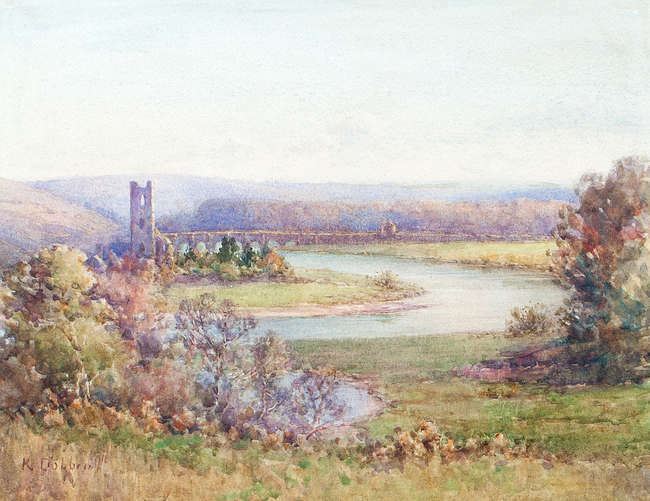 “Inniscarra Abbey on the River Lee” watercolour (13¾” x 17¾”), sold at Adams – 22/11/2015 for €420.00. 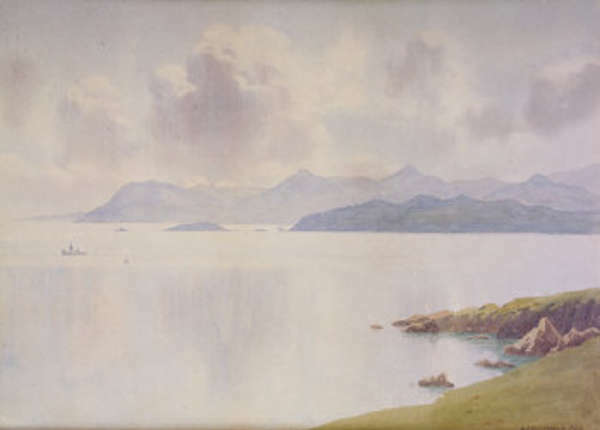 Left to right: “Figures in a boat Roundstone Harbour” watercolour (15″ x 8″) sold by Whytes – 21/5/2012 for €3,000.00; and “Irish Coast” watercolour (8″ x 12″) sold by Bamfords, Derbyshire – 10/12/2009 for £300.00. 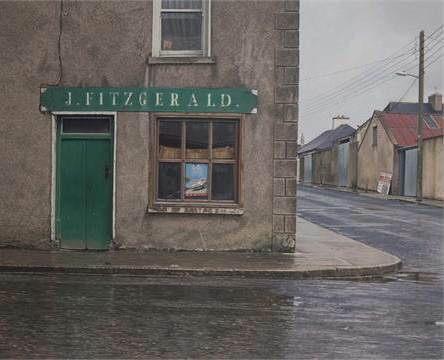 Described as a photorealist, painter and landscape artist John Doherty was born in County Kilkenny and trained as an architect at the Bolton Street College of Technology in Dublin. He then moved to Australia where he studied drawing and painting at the National College of Art, Port Moresby, Papua New Guinea. After extensive travels around the world, Doherty settled in Melbourne. 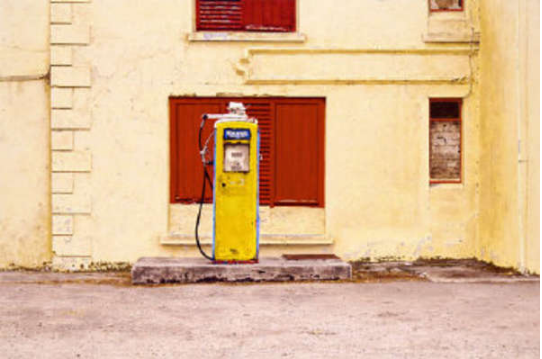 “Maxol Lubrication, Dingle” oil on canvas (39.5″ x 59″), sold at Adam’s – 30/5/2007 for €84,000. “Wet Day, Cork” oil on canvas (36″ x 44″), sold at de Vere’s – 22/11/2016 for €20,000. 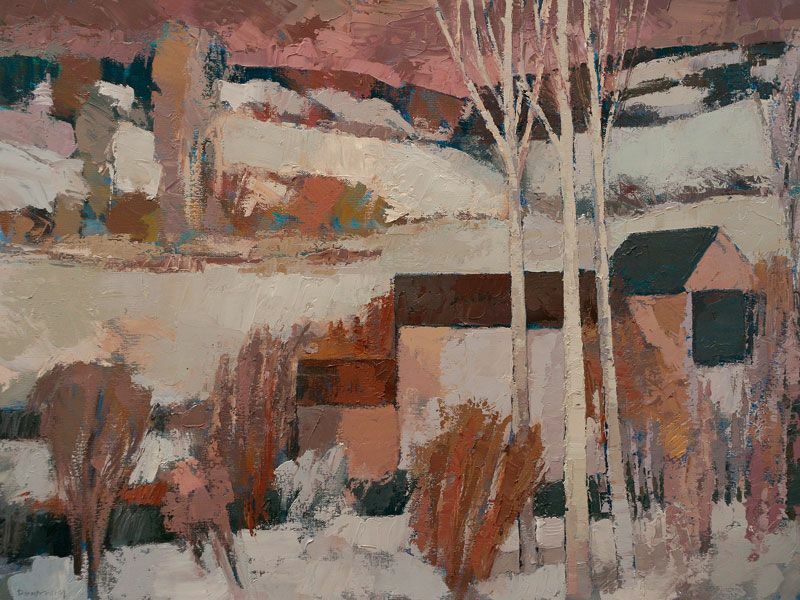 “Winter Farm” oil on canvas (24″ x 32″). 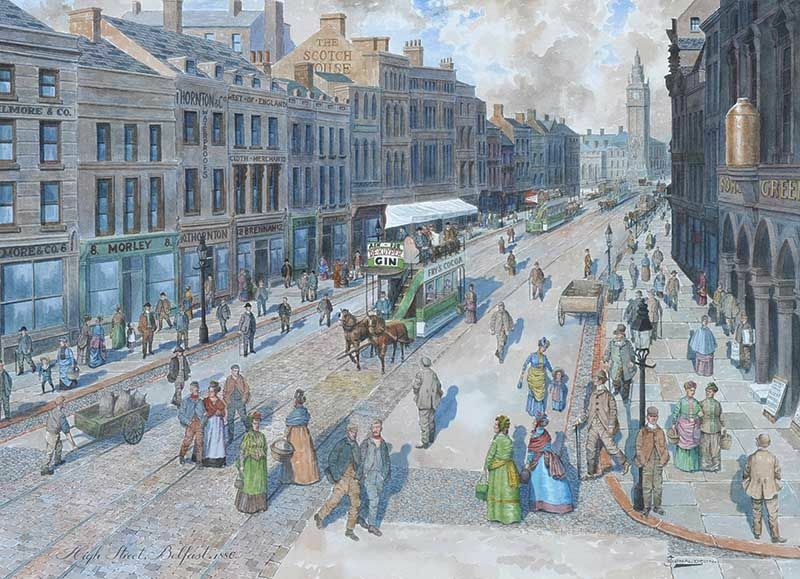 “High Street, Belfast” watercolour drawing (15″ x 21″), unsold at Ross’s – 3/5/2017. 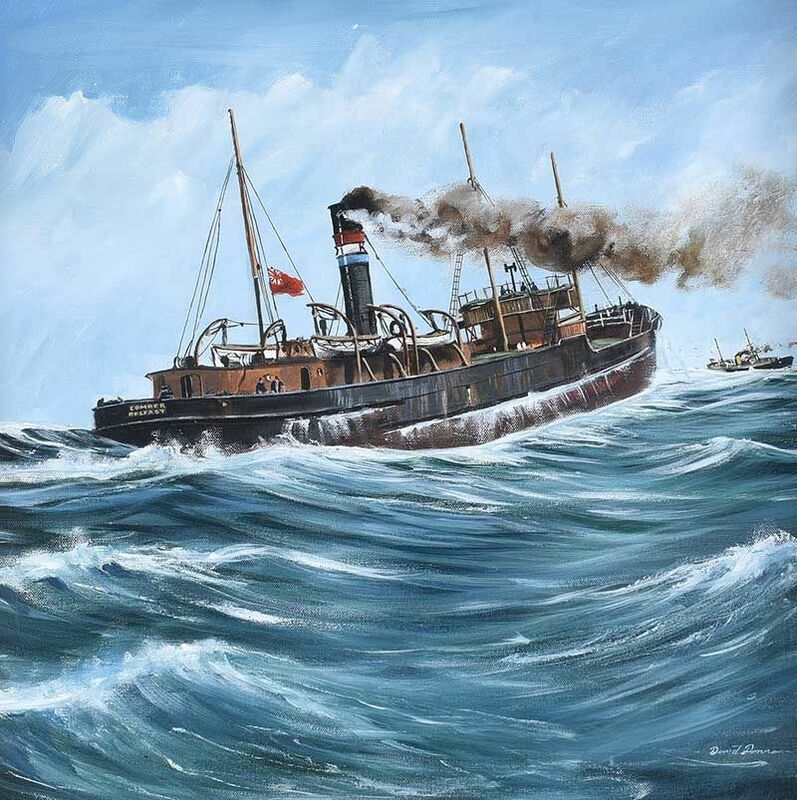 Kelly’s Coal Boat “Comber”, oil on canvas (20″ x 20″), sold at Ross’s – 8/8/2018 for £40.00. 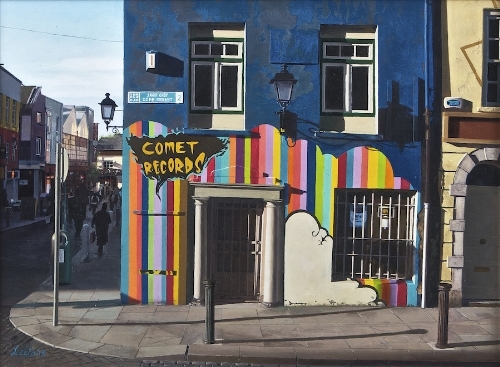 Left to right: “Dappled Light on the Back Steps” oil on board (10″ x 8″), sold at Adam’s – 7/12/2016 for €1,600.00; “Little Record Shop, Cope Street” oil on board (8″ x 10¾”), sold at Adam’s – 25/9/2013 for €2,300. 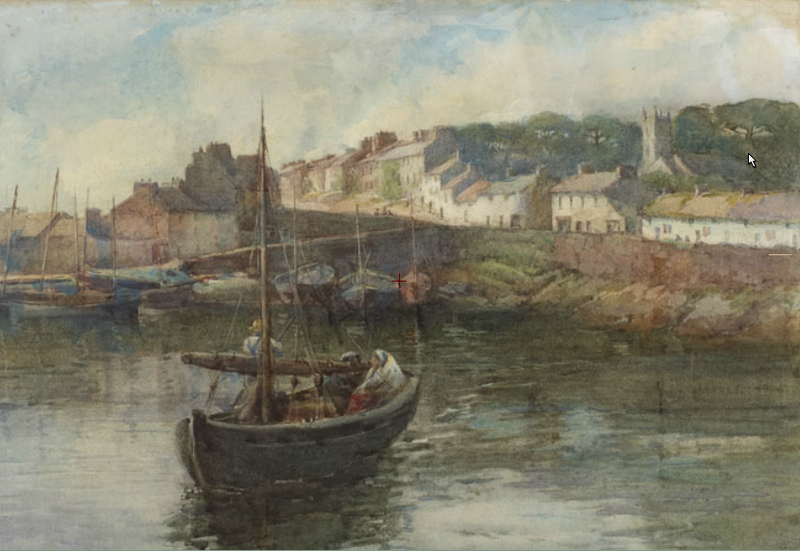 Born in County Wexford and attended the National College of Art & Design. 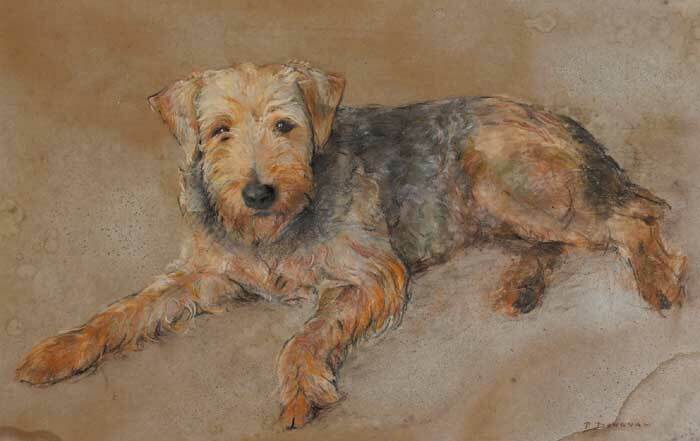 “Airedale Terrier” pastel on tinted paper (17″ x 26.5″), sold at Whyte’s – 26/5/2007 for €500.00. 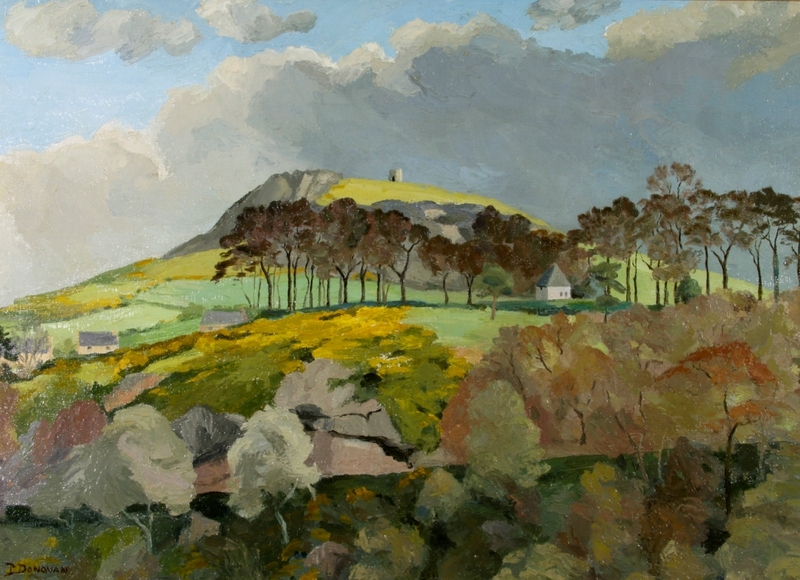 “Vinegar Hill, Enniscorthy” Wexford Co.Council Art Collection. 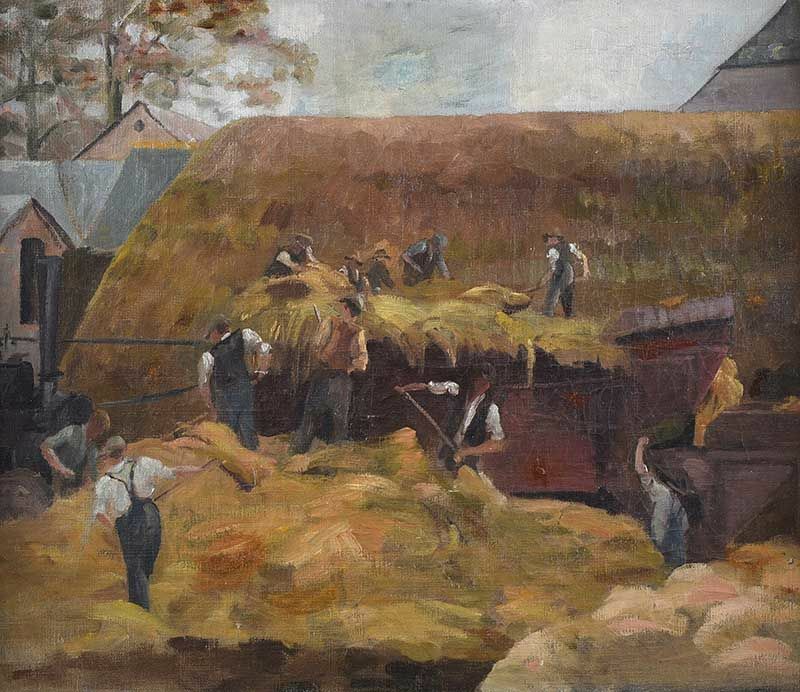 “Saving the Hay” oil on canvas (25″ x 29″), sold at Sheppard’s – 27/11/2018 for €700.00. “Boats moored on a Lily Pond” oil on board (16″ x 20″), sold at de Vere’s – 17/4/2018 for €850.00. 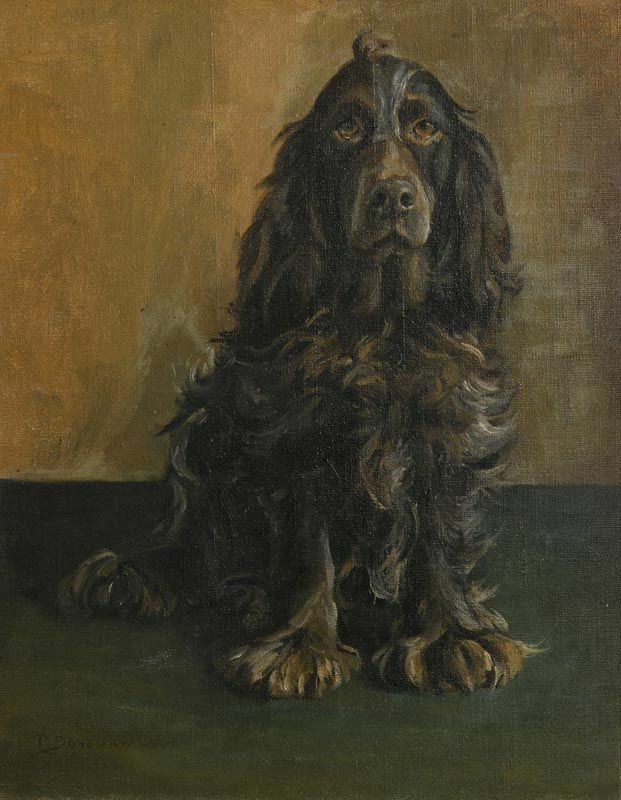 “Cocker Spaniel” oil on canvas (18″ x 14″), sold at Morgan O’Driscoll’s – 2/10/2018 for €220.00. “Pots in Sunlight” oil on canvas board (20″ x 20″), unsold at Adam’s – 27/3/2019. Born in Adare, Co. Limerick, Christopher Doran studied at the Limerick School of Art and Design under Richard Butcher. 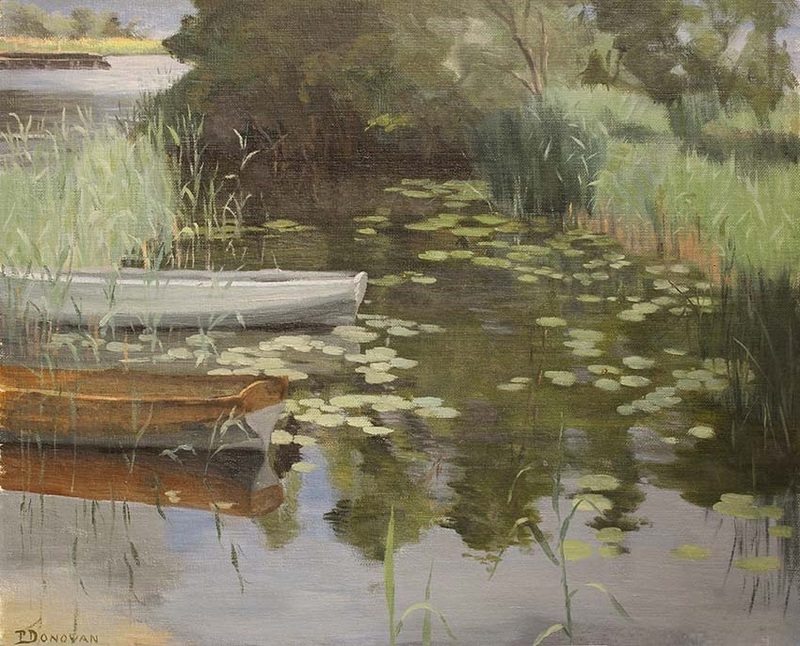 He worked as a commercial artist in New York and on returning to Limerick he opened a studio in William Street. 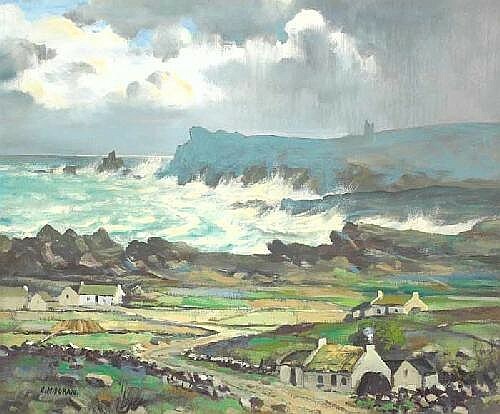 “Sybil Head, Kerry Coast” dated 1962, oil on board (24″ x 28.5″), sold at Whyte’s – 26/5/2007 for €750.00. 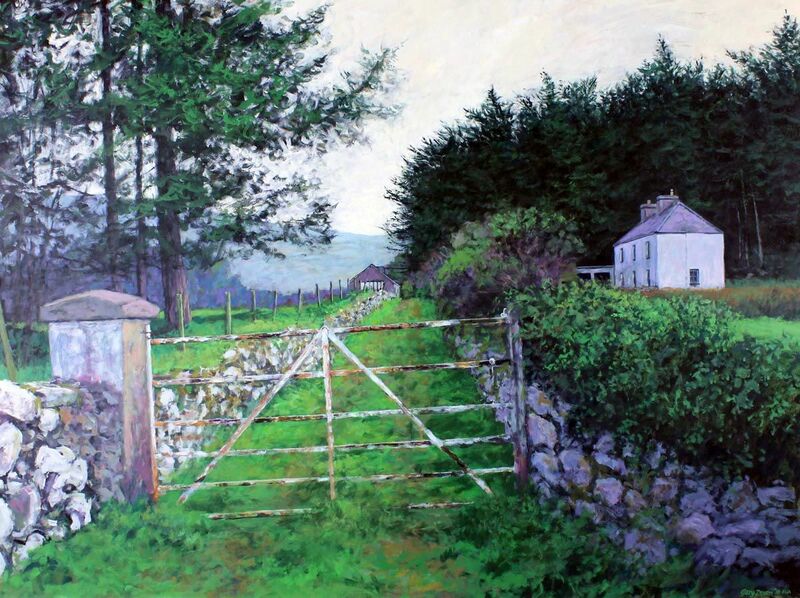 “Clare Glen, Tandragee” oil on canvas (14″ x 18″). Sold at Ross’s – 10/8/2016 for £20.00. Probably Irish. 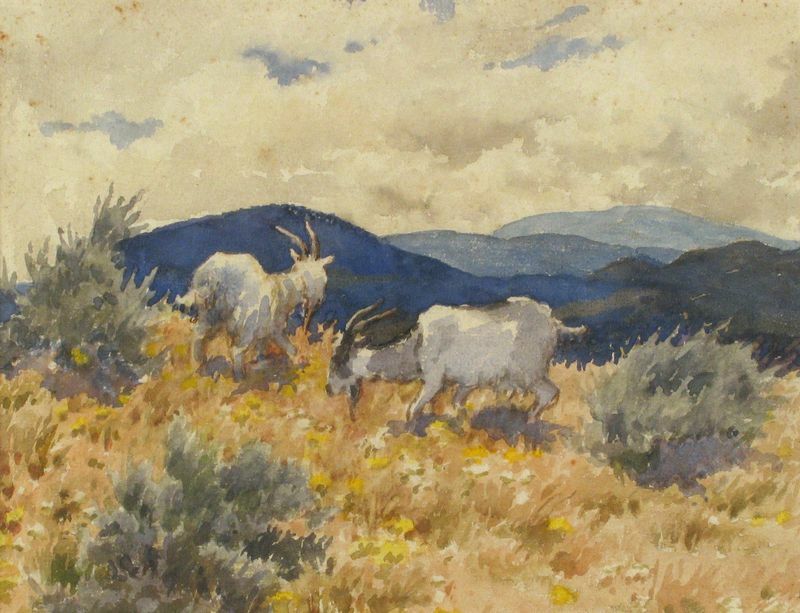 Active early 20th century. 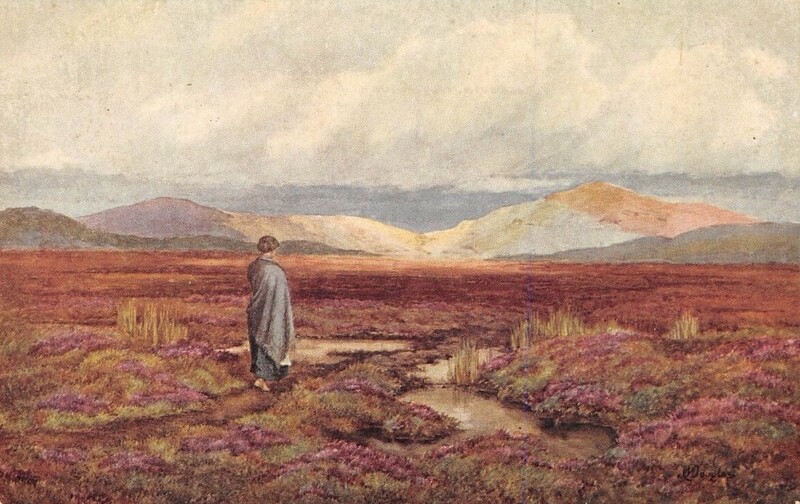 “Wild Connemara” – a postcard published by Eyre & Spottiswoode, London. 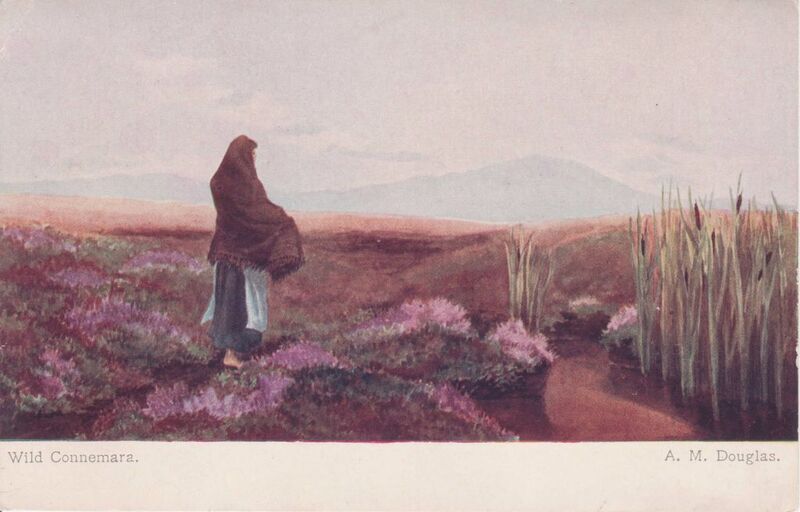 “The Kingdom of Kerry” another Eyre & Spottiswoode postcard. 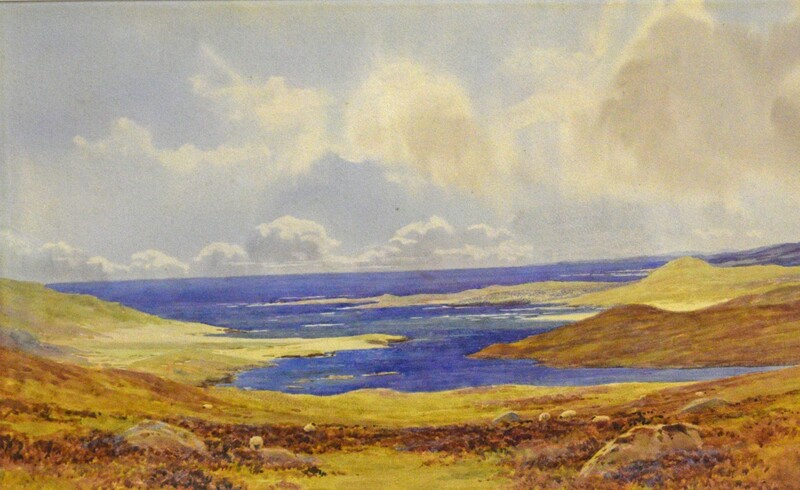 Above: The original of ‘Wild Connemara‘, an (18″ x 28″) watercolour, turned up at auction at Keys (Norwich) on the 23/7/2018 where it sold for £55. 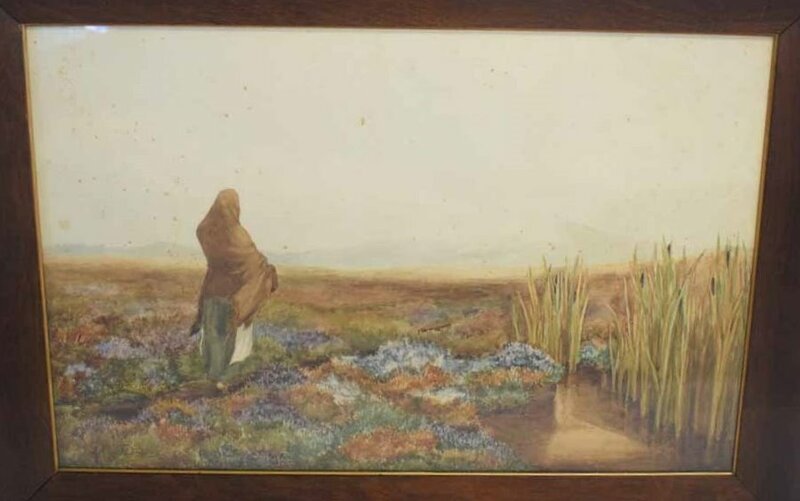 Left to right: Portrait of an old Breton Woman, watercolour (20″ x 14.5″), sold at Adam’s – 7/9/2011 for €800.00; and “Brittany Maid” watercolour (11″ x 8″), sold at Whyte’s – 16/9/2003 for €3,200. “Murlough, Donegal” watercolour drawing (10″ x 14″), sold at Ross’s – 1/3/2017 for £40. 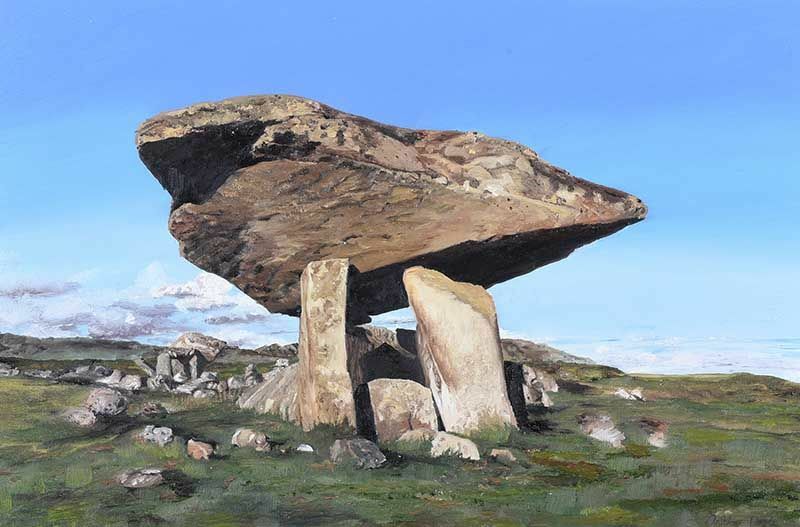 Cork born Michael Downes was a well known artist that worked in oils, acrylics, watercolours as well as pen and ink drawings. 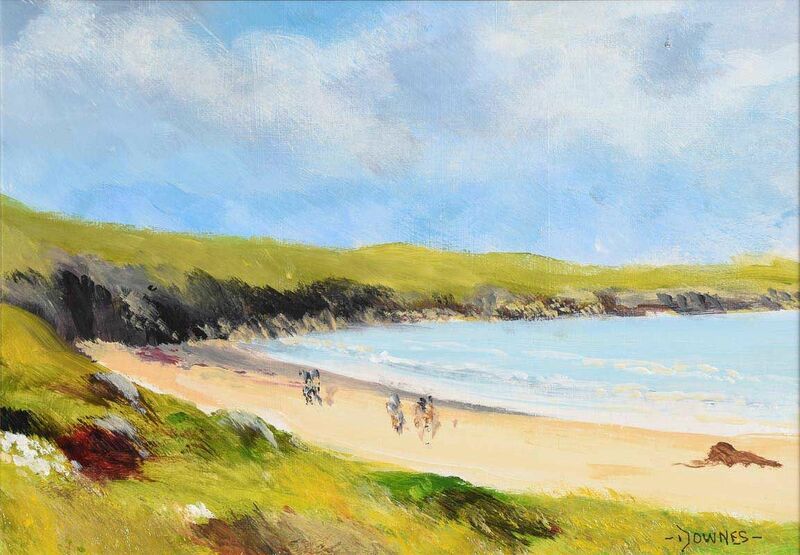 “Goat Island, near Ardmore, Co.Waterford” oil on board (7″ x 10″), sold at Morgan O’Driscoll’s – 3/10/2016 for €180.00. “Lake Shore, Killarney” oil on canvas board (8.5″ x 12.5″), unsold at Ross’s – 14/8/2018. 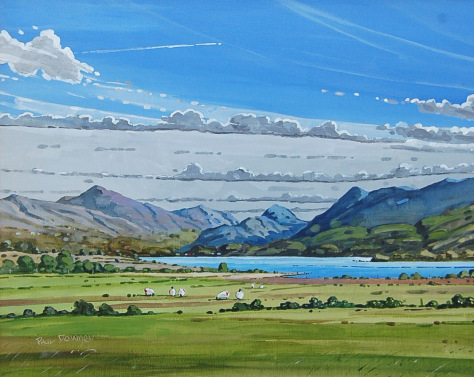 Sport and landscape artist from County Waterford who now lives and works in Killarney. Undertakes commissions. 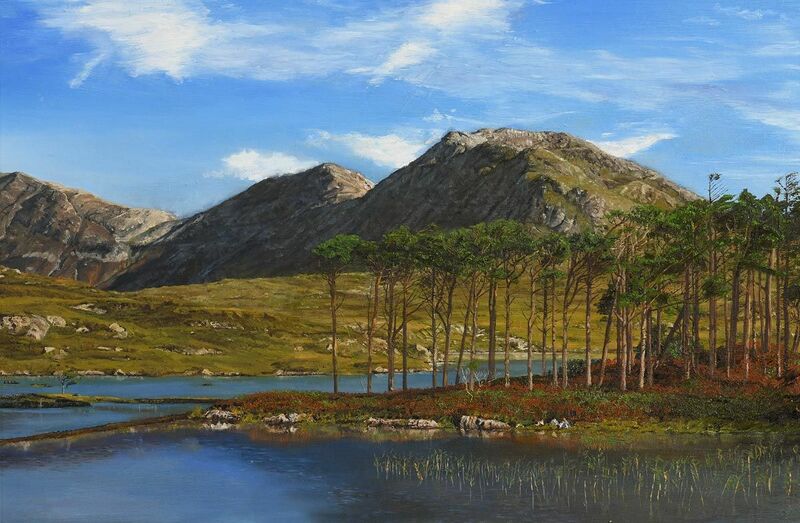 “Lough Guitane, Killarney” acrylic on board (16″ x 20″). 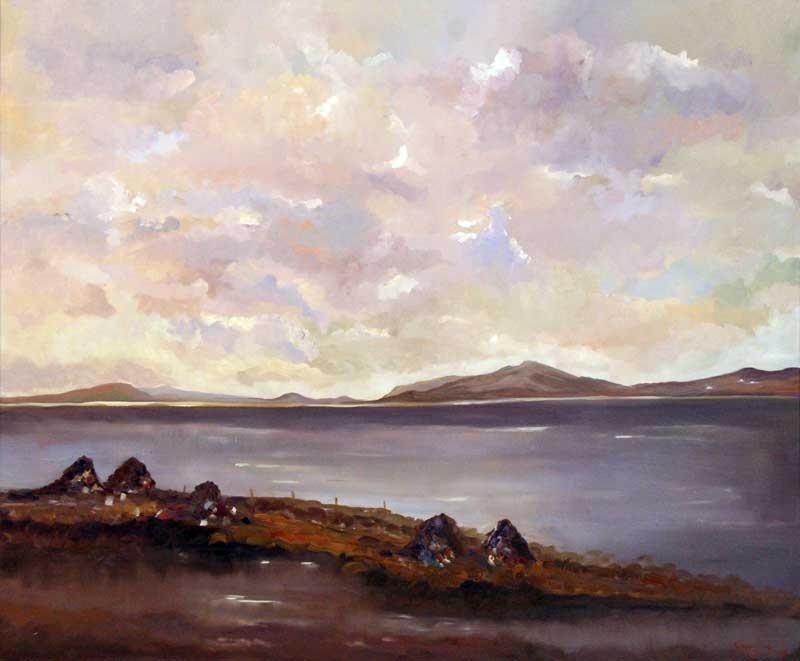 “Reflections, Connemara” dated 2004, oil on board (19.5″ x 29.5″), sold at Morgan O’Driscoll’s – 14/8/2018 for €480.00. 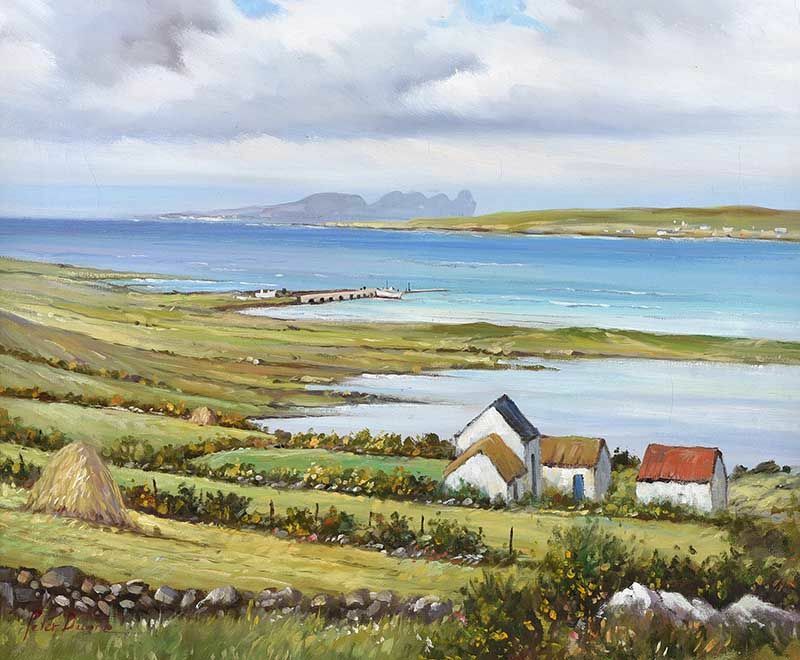 Left to right: “Inishmore” oil on canvas (20″ x 27″), sold at Ross’s – 13/2/2019 for £80; and “Dolmen, Donegal” oil on board (20″ x 30″), sold at Ross’s – 5/12/2018 for £70. 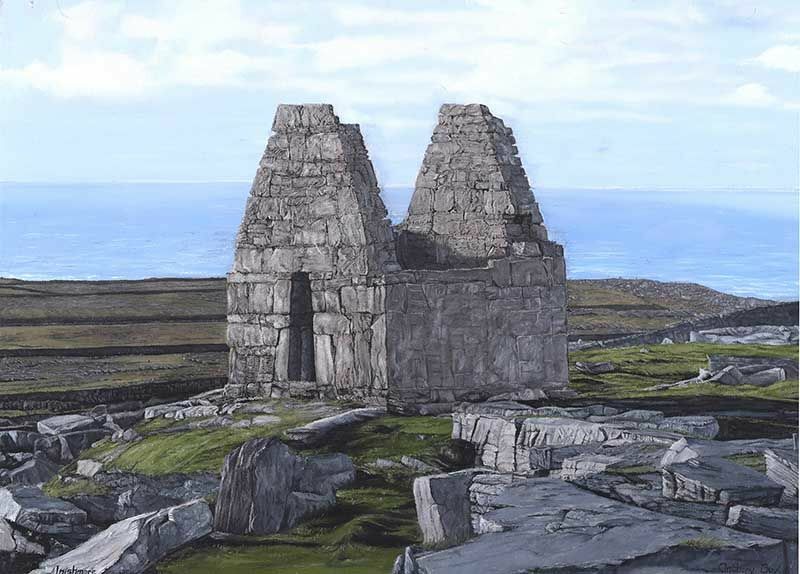 “Turf Stacks, Connemara” oil on canvas (15.5″ x 19.5″), sold at Sean Eacrett’s (Doyle’s Schoolhouse Sale) – 30/9/2017 for €42.00. 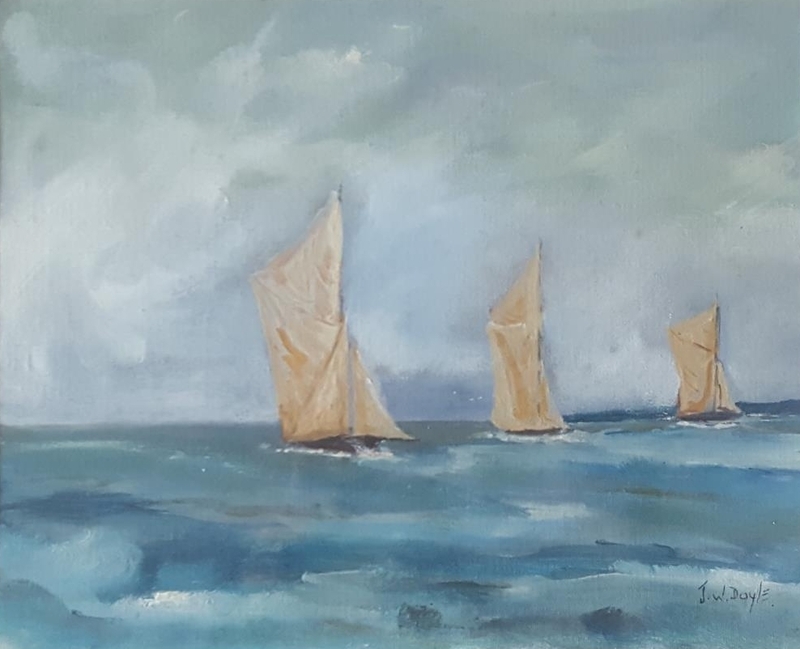 “Three Galway Hookers on the Way Home” oil on board (9″ x 11″), sold at Sean Eacrett’s (Doyle’s Schoolhouse Sale) – 30/9/2017 for €45.00. 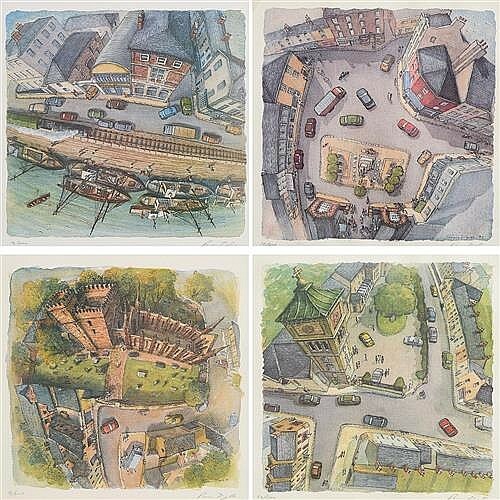 Above: a selection of his bird’s eye view line drawings of Wexford. 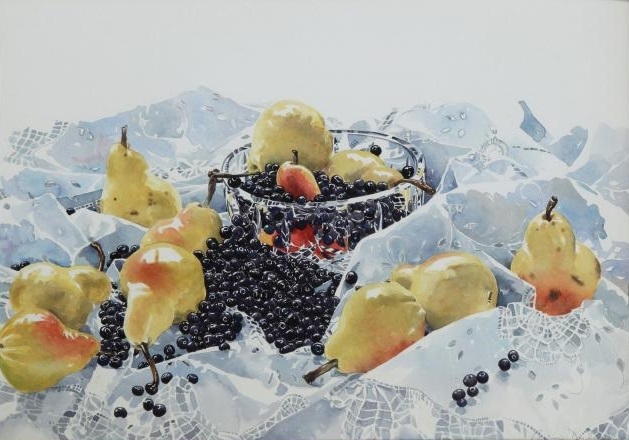 Left to right: “Apples” watercolour (18″ x 18″), sold at Adams – 16/12/2014 for €200.00; and “Pears & Blueberries” watercolour (18″ x 26″), unsold at Dolan’s – 3rd/4th August, 2015. 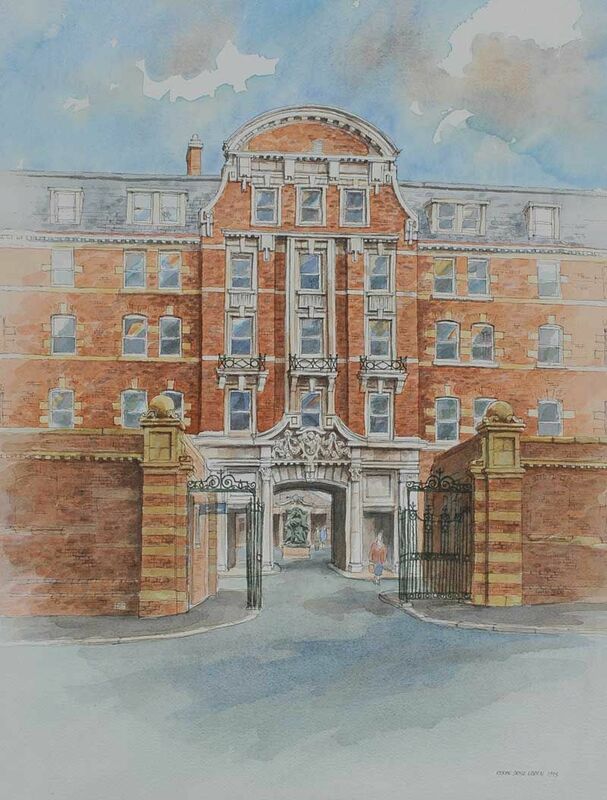 “Royal Victoria Hospital” watercolour drawing (21″ x 16″), unsold at Ross’s 7/12/2016. 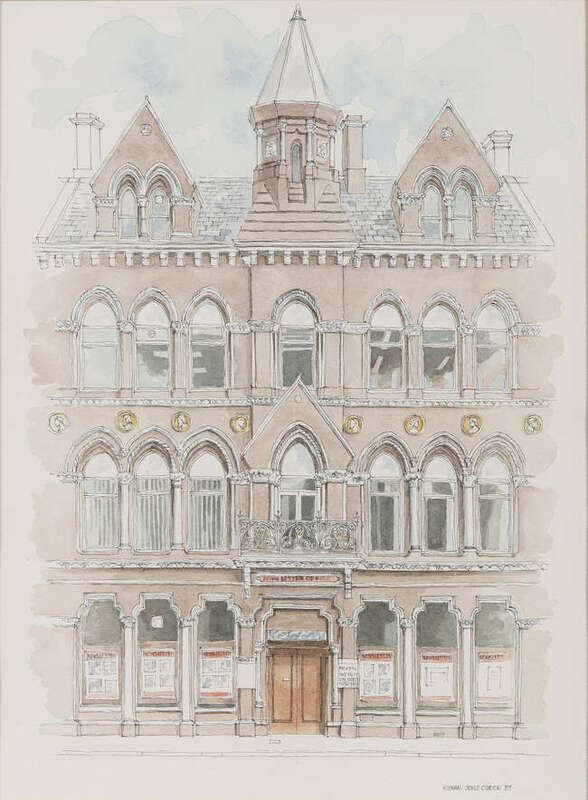 “The Belfast Newsletter Building” 1990, pen and ink and watercolour (15.5″ x 11.5″), sold at Adam’s – 8/10/2018 for €170.00. 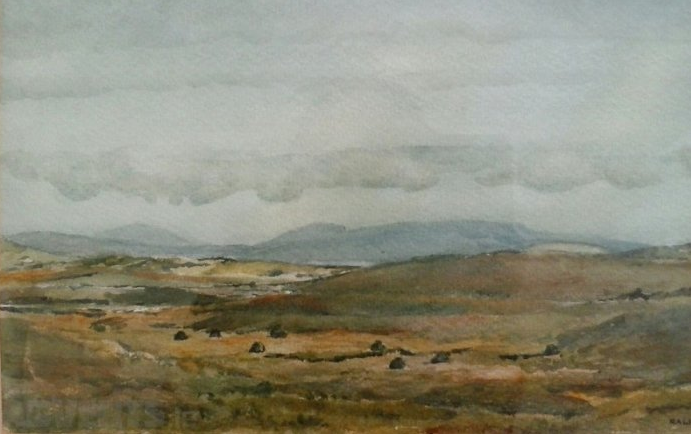 “Dublin Hills from Howth” watercolour (10″ x 14″), sold at Adam’s – 29/9/2004 for €380.00. 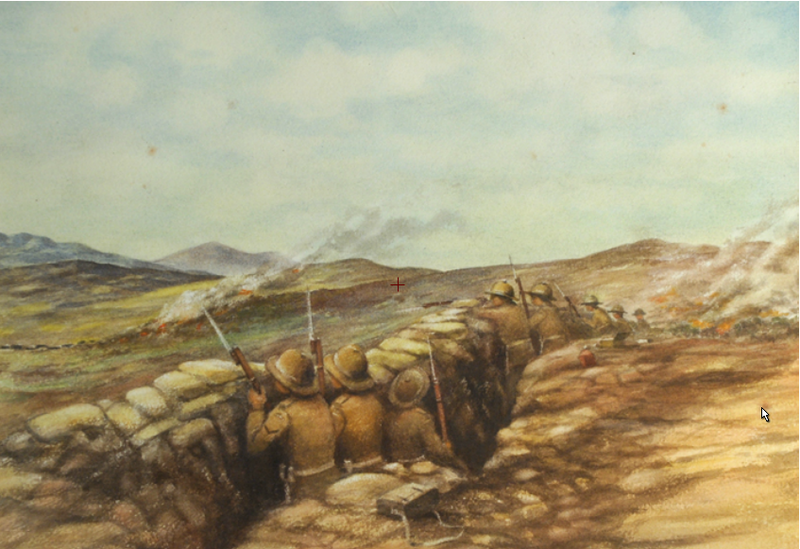 Left to right: “Dublin Fusiliers in the trenches, Kavakal Dagh, Gallipoli, August 1915″ watercolour, (9.5″ x 12″) sold at Whyte’s – 9/3/2014 for €850.00; and “Coastal Scene with Sheep Grazing” watercolour (12.5″ x 18″), sold at Mealy’s Fine Art – 31/7/2017 for €200.00. 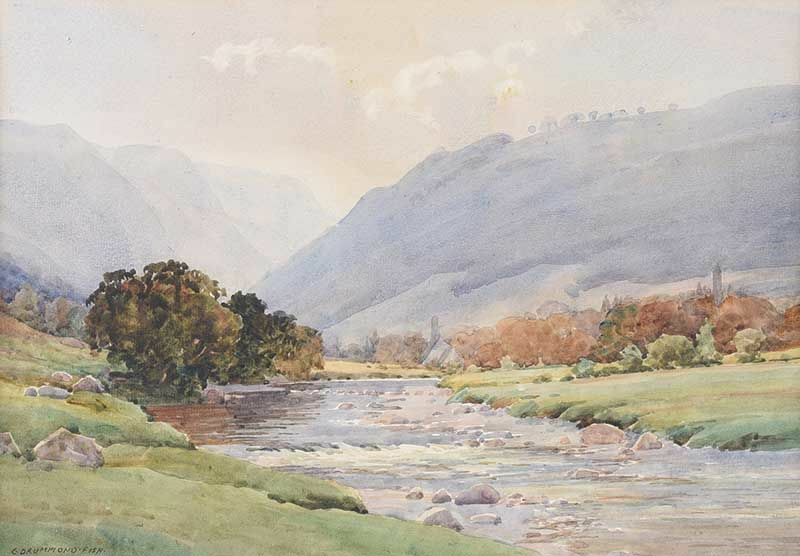 “Black Valley, Killarney” watercolour (10.5″ x 15″), unsold at Sheppard’s – 29/8/2017. 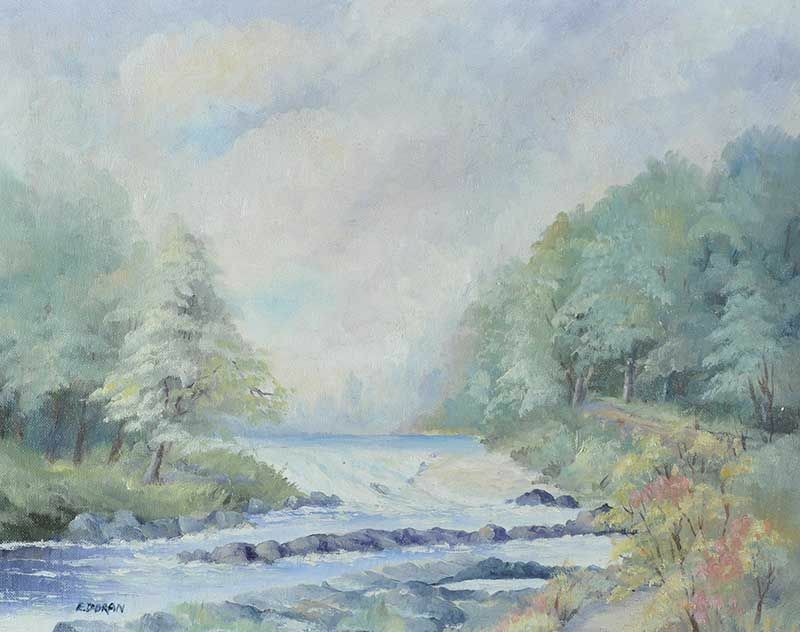 “The River at Glendalough” watercolour drawing (10″ x 14″), sold at Ross’s – 13/9/2017 for £140.00. 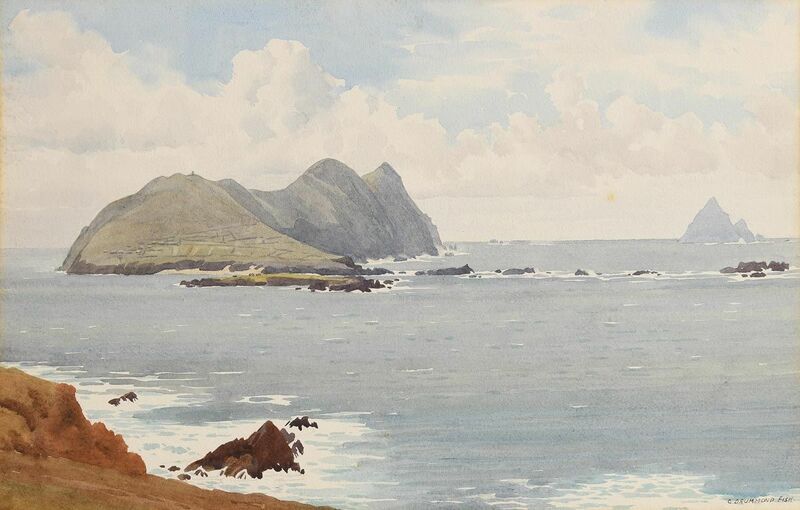 “Blaskets” watercolour (11.5″ x 18″), sold at Morgan O’Driscoll’s – 7/8/2018 for €550.00. 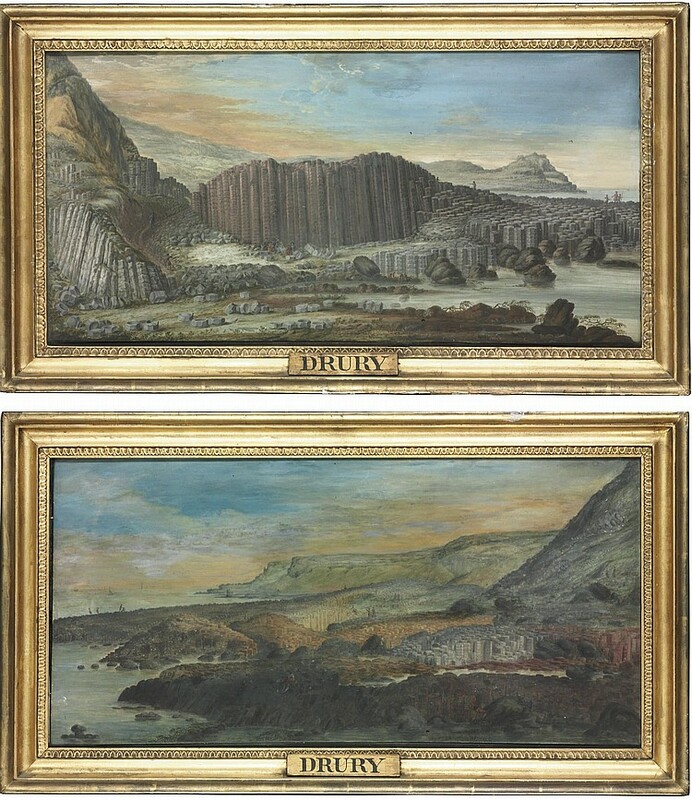 Susanna Drury was a mysteriously obscure but very able painter whose views of the Giant’s Causeway in County Antrim are landmarks both in Irish topographical painting and in European scientific illustration. Her exact birth and death dates are not known but she was the sister of a Dublin miniature painter named Franklin Drury, who died in 1771. 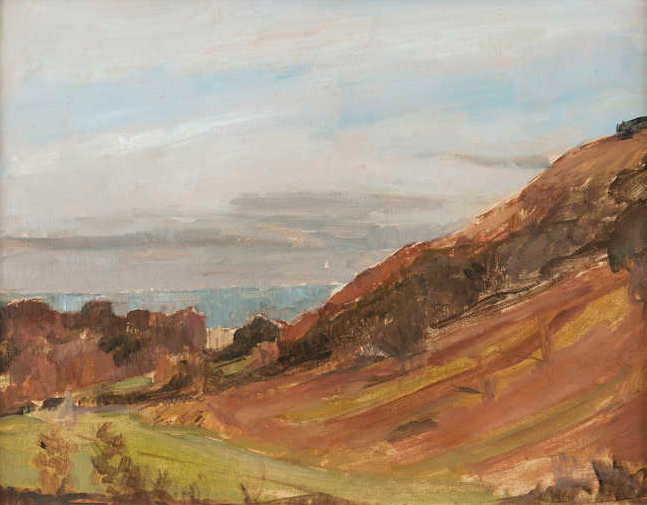 The first trustworthy views of the Giant’s Causeway ever produced, Susanna Drury’s gouaches of 1739-40 won the £25 premium of the Dublin Society in 1740 when the artist’s identity was disclosed to the Society by Dean Gabriel Maturin, a prominent Dublin Huguenot. This raises the question of whether Susanna Drury had Huguenot connections or may have been trained on the continent. 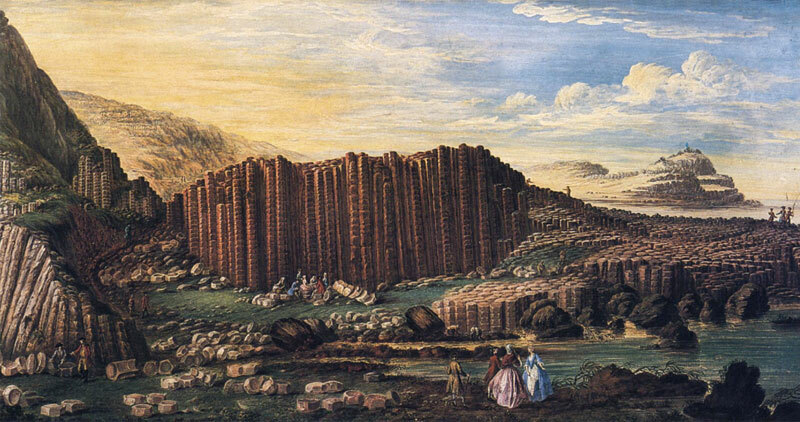 The groups of fashionably-dressed figures in both of Susanna Drury’s paintings show that as early as 1740 the Giant’s Causeway had become a tourist attraction. Ref: BBC. 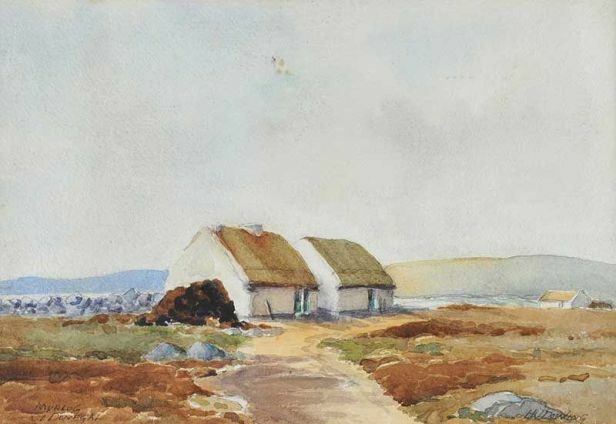 One of a pair of Drury’s 1839 watercolours held in the collection of the Ulster Museum. 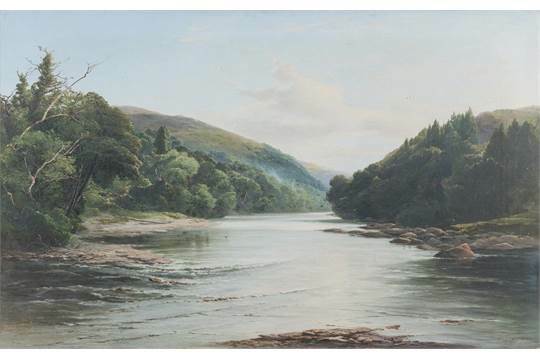 Above – a further pair of watercolours dating from the same period were sold at Christies, London, “Glin Castle: A Knight in Ireland” sale – 7/5/2009 for £23,750.00. 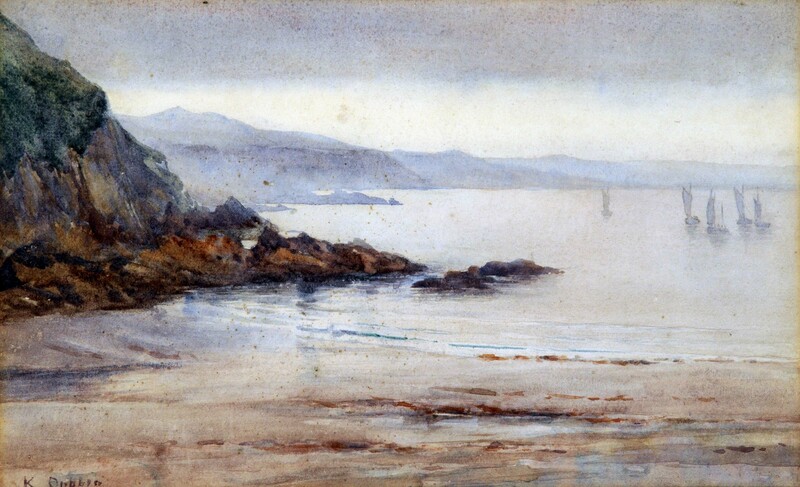 They originated in the Duke of Leinster’s collection and it’s uncertain which pair of watercolours won the Dublin Society prize mentioned at the top of this entry. 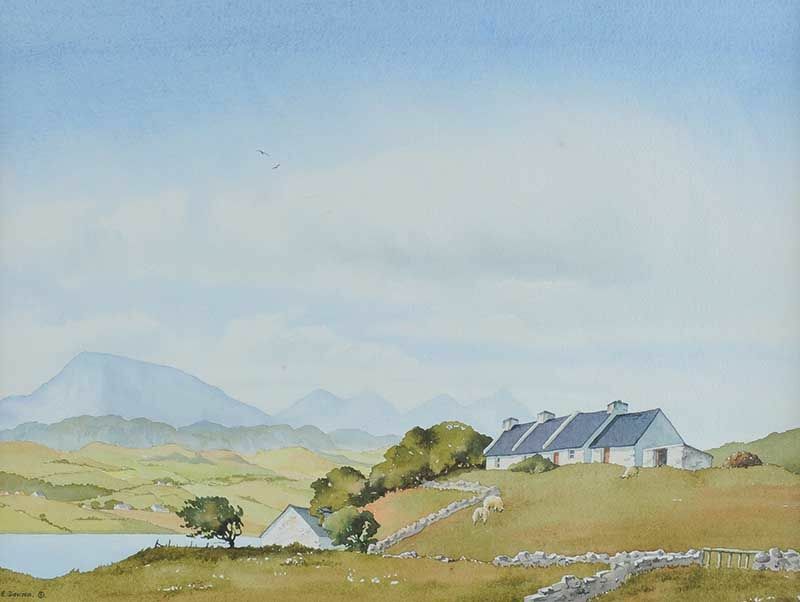 West of Ireland landscape – watercolour (19″ x 22″) – sold on Adverts.ie for €49 in 2016. 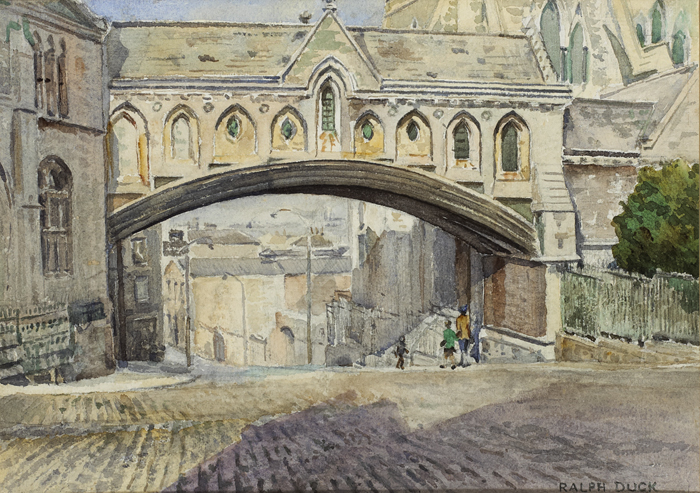 “The Arch, Christchurch Cathedral, Dublin” watercolour over pencil (10.5″ x 14.5″), sold at Whyte’s – 9/12/2012 for €220.00. 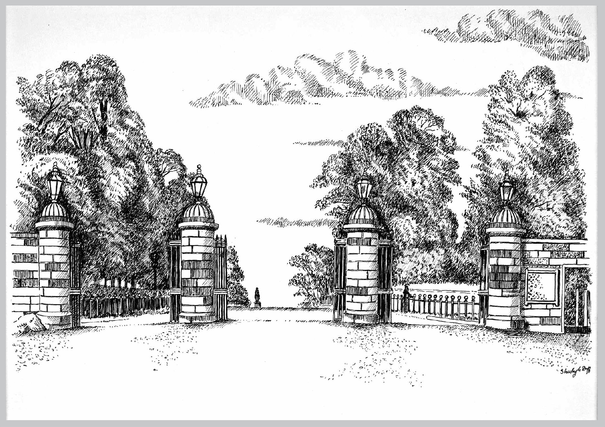 “Phoenix Park, Parkgate Street Entrance” part of a set commissioned in 1987 by the Irish Government’s Office of Public Works to create an “Illustrated Record of the Phoenix Park”. Self-taught Irish portrait artist specialising in coloured pencil. 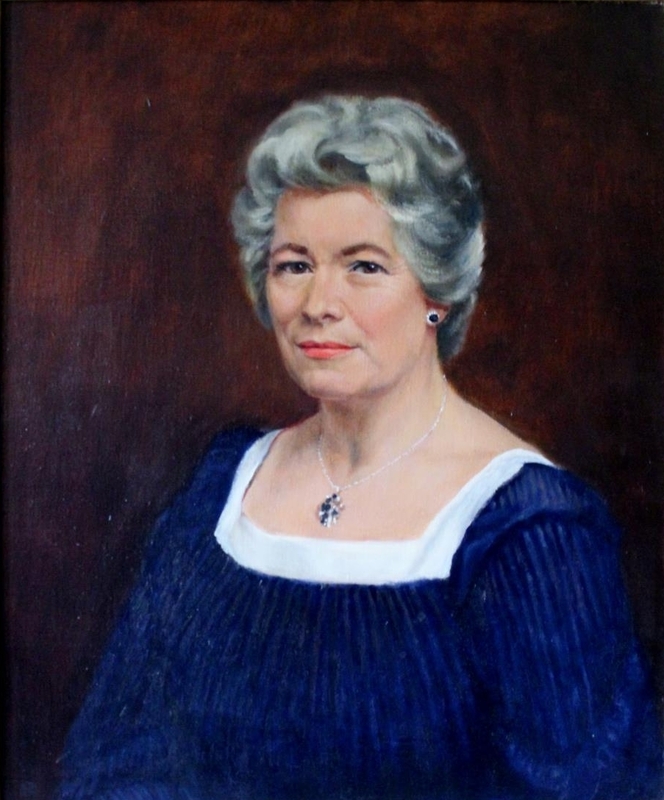 Portrait of Anita Lett founder of the Irish Countrywomen’s Asociation specially commissioned by the ICA. “Winter Woodland” oil on board (9.5″ x 14″). 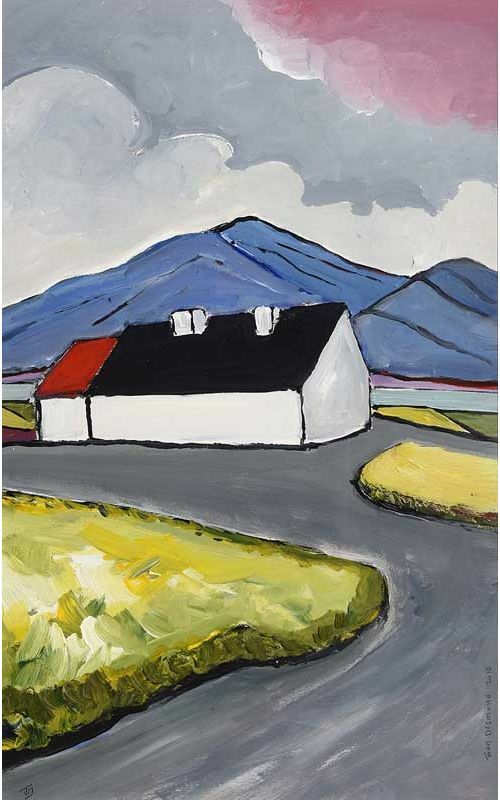 “Donegal Cottage” oil on canvas (14″ x 18″), sold at Ross’s – 13/3/2019 for £40.00. Máiréad Duffy is from Northern Ireland. Máiréad’s career has seen her live and work in London and then onto Kuwait in the Middle East. These years away were a huge influence in her life and have influenced her work. Returning to Ireland in 2004 Máiréad secured a job as Coordinator of Art and Design at Southern Regional College in Armagh. 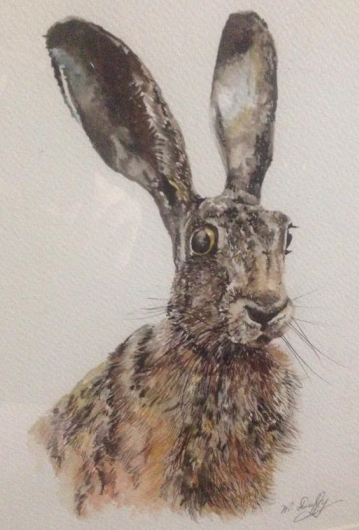 She carries out private commissions and works on local exhibitions at her home studio in Keady throughout the year and showcases her work at various local events. 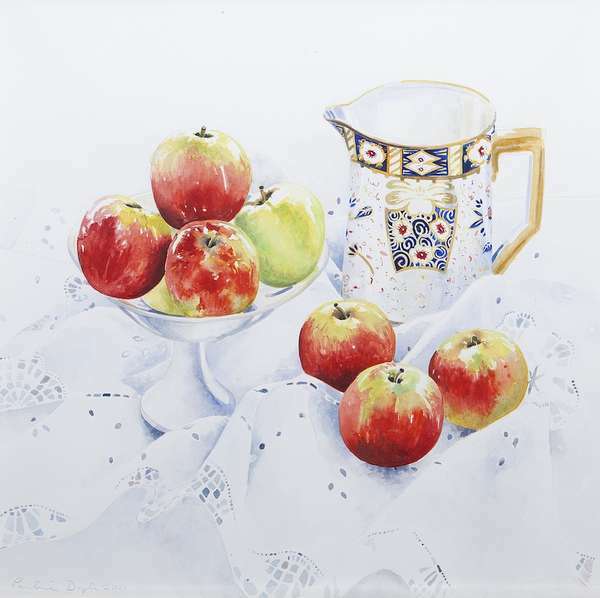 She works in a number of mediums such as Ink, Watercolour & Acrylics to depict a wide variety of subject matter. 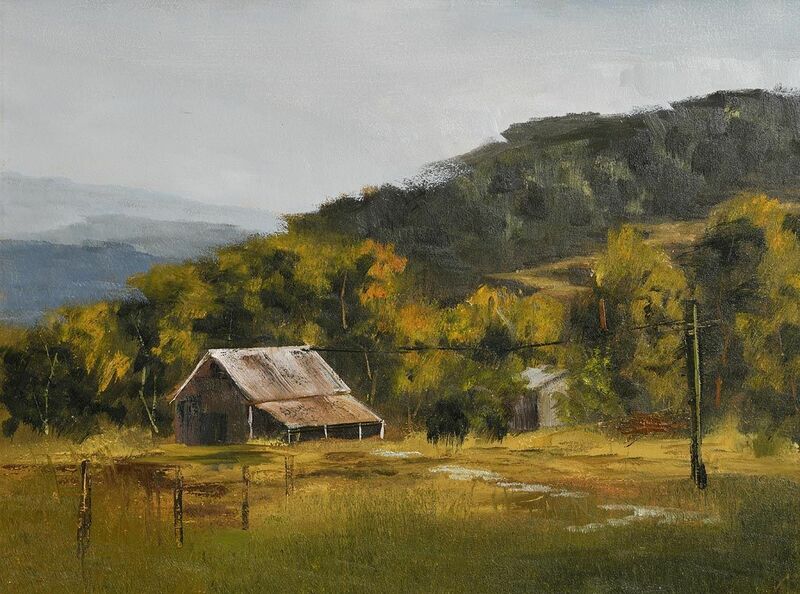 Her current collection features local rural scenes and wildlife, this is a subject matter close to her heart. 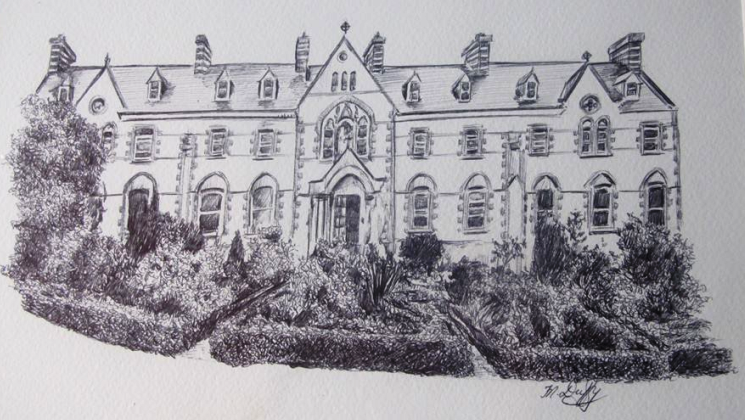 “The Old Convent” a pen and ink drawing. 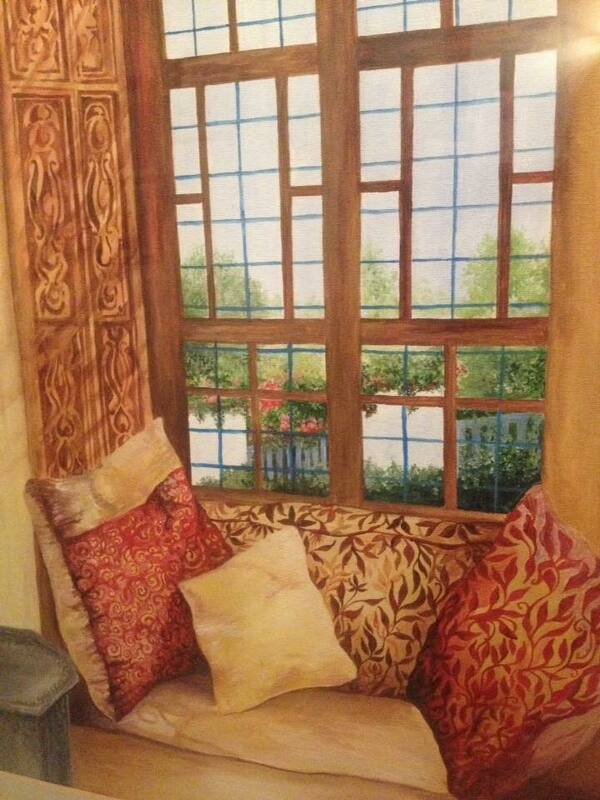 Left to right: “The Window Seat” acrylic on board and “Hare” watercolour. 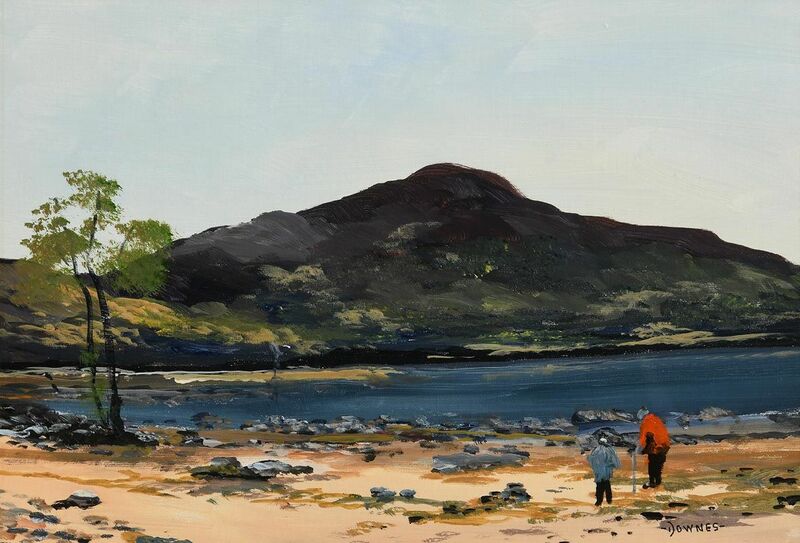 Michelle Duffy specialises in both contemporary and traditional interpretations of the Irish Landscape. She has a particular love for sunsets and water-based scenes. Living in Garrison, County Fermanagh she has daily access to Lough Melvin and its great beauty! “Meeting of the Waters” oil on panel, sold at James Adams – 23/3/2016 for €3,600. 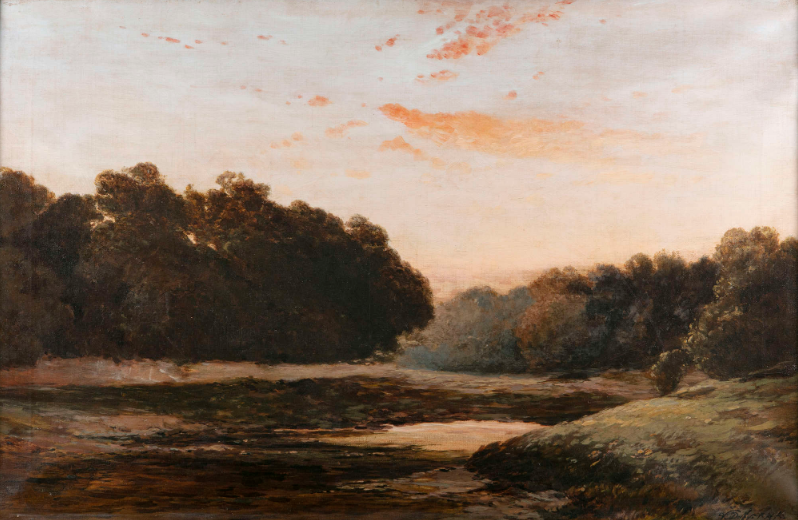 “Evening Time on the Dodder River” oil on canvas (24.5″ x 37″), exhibited at the RHA 1888, unsold at Adam’s – 27/3/2019. 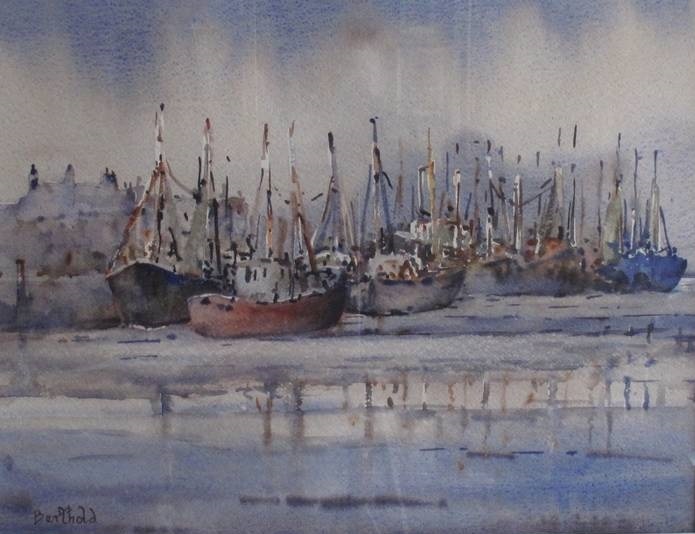 “Shore at Annalong” watercolour drawing (11″ x 14″), sold at Ross’s – 28/10/2015 for £50.00. 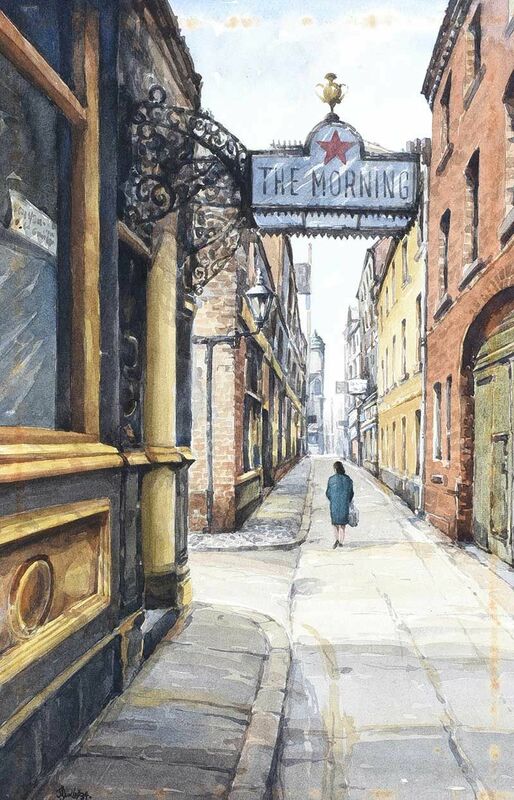 “The Morning Star, Pottingers Entry, Belfast” watercolour drawing (19″ x 12″), sold at Ross’s – 7/11/2018 for £180.00. 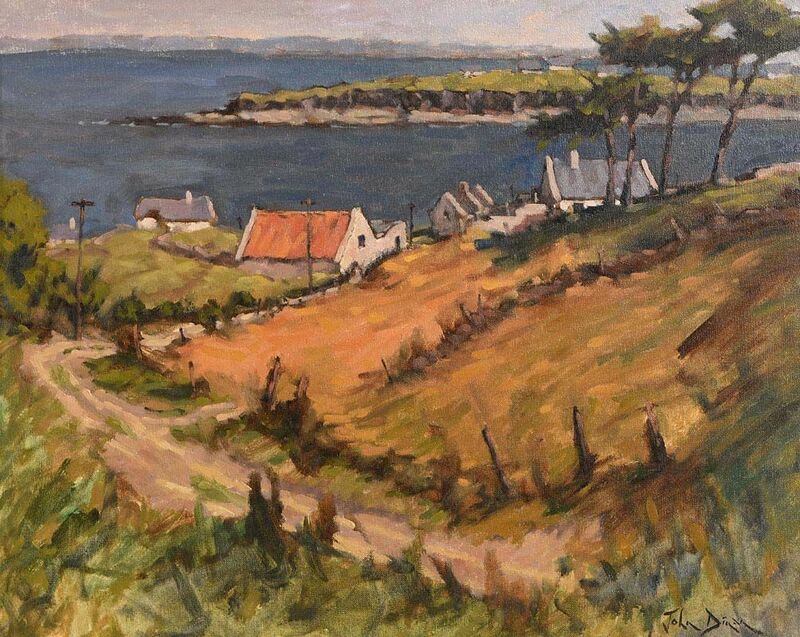 “Schull, Co.Cork” oil on canvas (12″ x 16″), sold at Woolley & Wallis – 24/9/2014 for £1,000. “Glenarm” oil on board (13.5″ x 17″), sold at Adam’s – 27/9/2017 for €100.00. 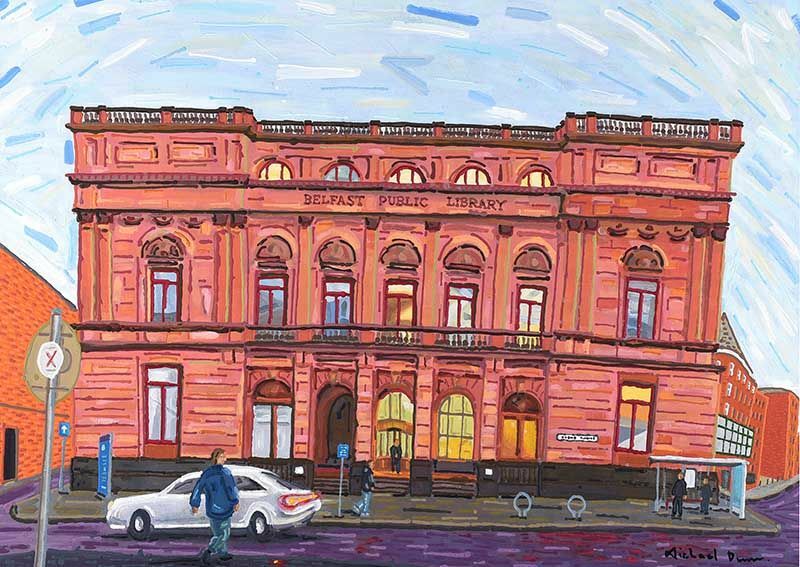 “Belfast Public Library” oil on canvas (28″ x 40″), sold at Ross’s – 7/12/2017 for £150.00. 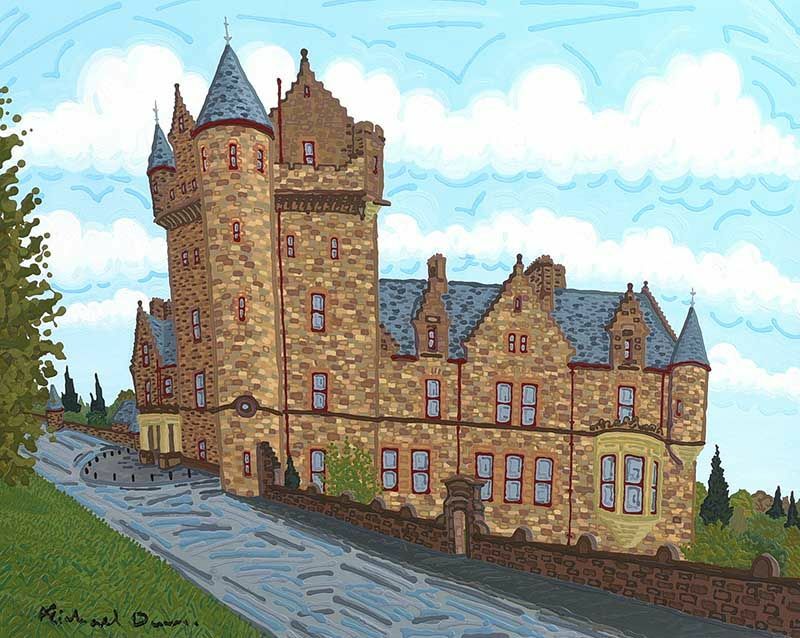 “Belfast Castle” oil on board (16″ x 20″), unsold at Ross’s – 10/10/2018. 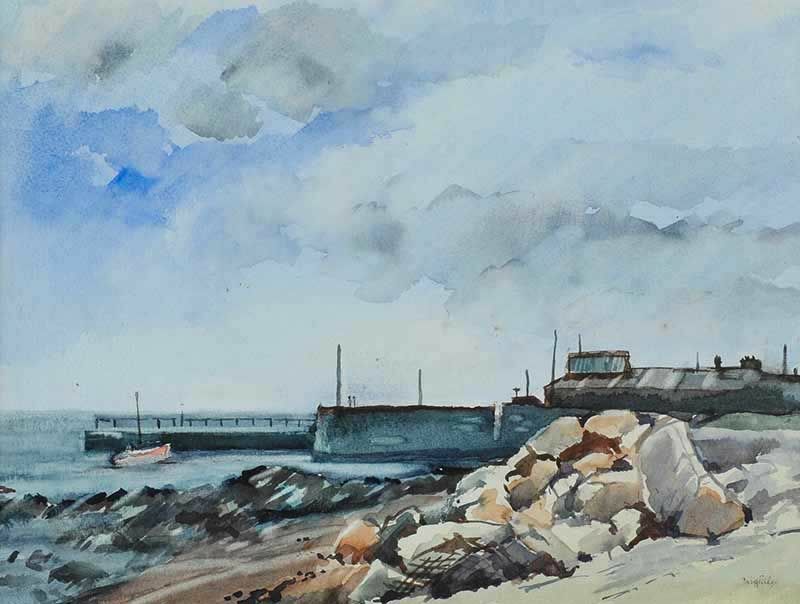 “Dun Laoghaire Harbour” watercolour (18″ x 24″). 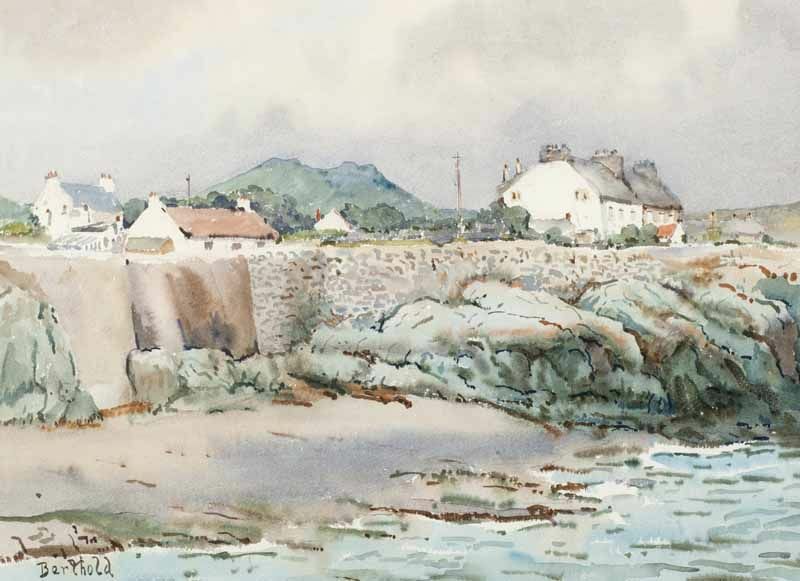 “Greystones, Cove” watercolour drawing (14″ x 19″) sold at Ross’s – 10/4/2013 for £50. 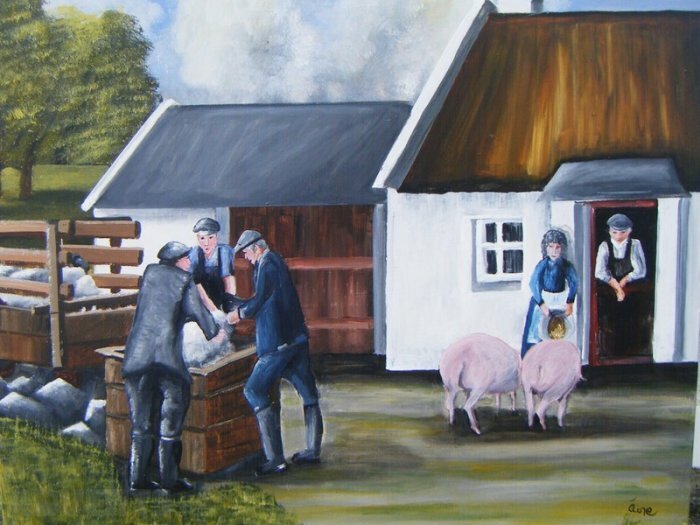 “Country Pastures, Leixlip” acrylic on board (19″ x 29″), sold at Morgan O’Driscoll’s – 25/9/2017 for €120.00. 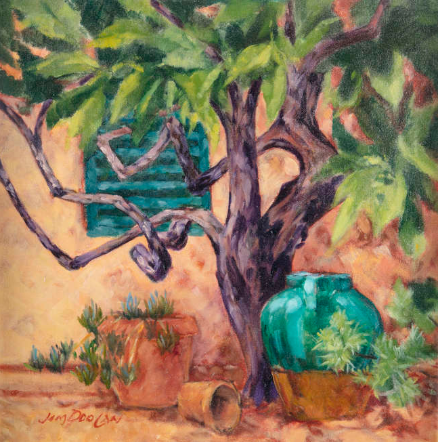 “Moroccan Villa” 1982, mixed media on board (15.5″ x 13″), sold at Morgan O’Driscoll’s – 2/10/2018 for €360.00. 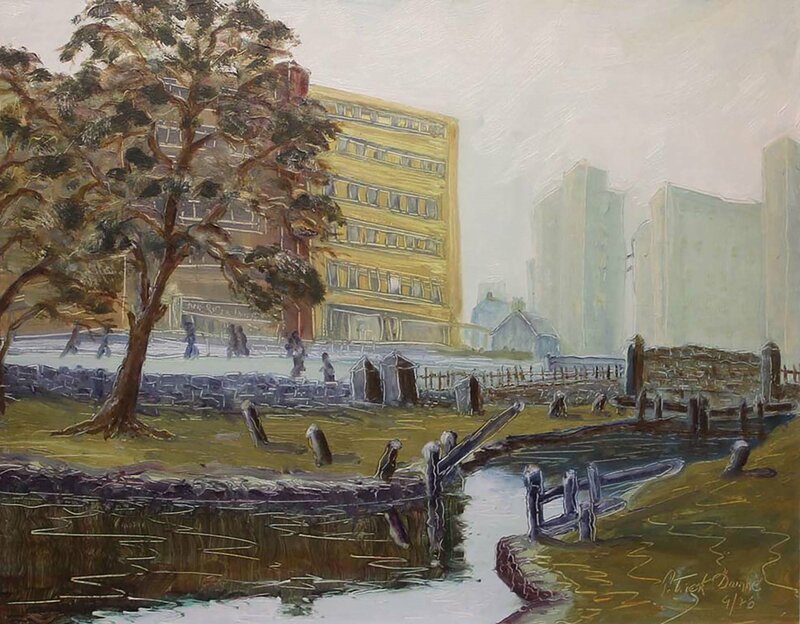 “Grand Canal, Dublin” oil on board (16″ x 20″), sold at de Vere’s – 18/7/2019 for €70.00. “Skelligs, County Kerry” oil on canvas (20″ x 24″), sold at Ross’s – 25/4/2018 for £50.00. 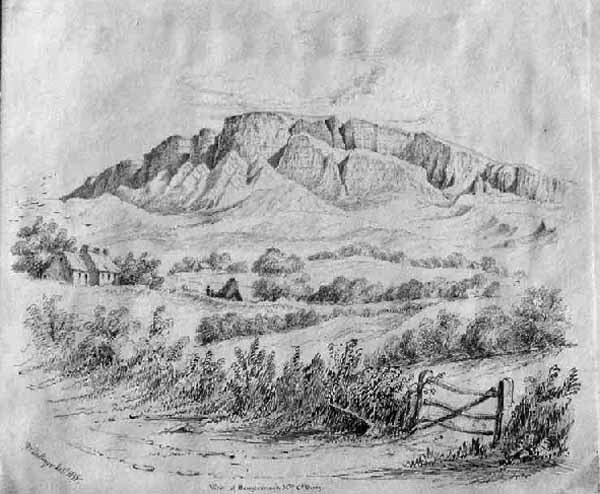 “View of Benyevenagh Mountain, Co.Derry” dated 1838 (7.5″ x 8.5″) – Geological Survey of Ireland Collection. 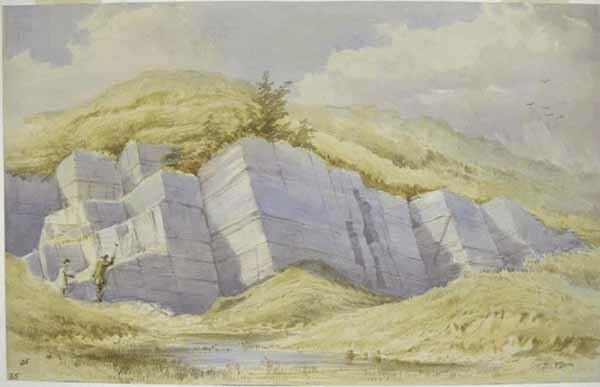 “Limestone folding, Kanturk, Co.Cork” dated 1866 (16″ x 25.5″) – Geological Survey of Ireland Collection. 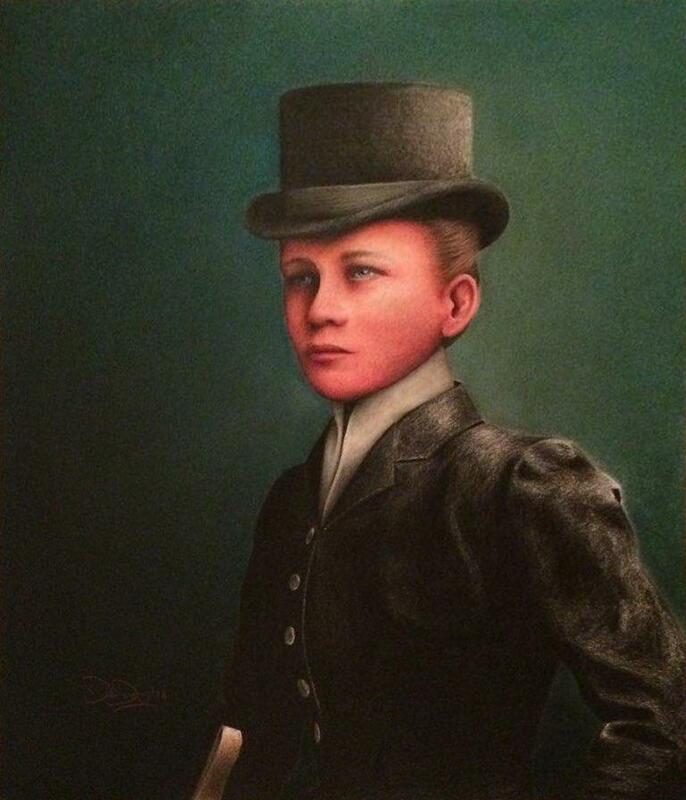 Belfast artist who paints in the style of the late Markey Robinson. “Cottages by the Sea” oil on board, unsold at Bloomfield Auctions (Belfast) – 27/6/2018.